CHAIRMAN: Counsel for the Tribunal will shortly take up his Opening Statement in relation to the two matters concerned in this phase of public sittings, that is, firstly, the reading of the evidence of Mr. Charles Haughey on deposition, together with some related evidence or statements; and secondly, evidence relating to certain transactions which appear to pertain to those Terms of Reference relative to Mr. Michael Lowry. Both matters are of considerable substance and I anticipate that the opening statements of counsel in relation to these matters will, in their aggregate, occupy, if not the entirety of this first day, virtually all of it. Before hearing from Mr. Coughlan in that regard, I have some brief introductory remarks to make. Firstly, the procedure of hearing the evidence of Mr. Haughey by way of examination on deposition proved to be considerably more convoluted and lengthy than had been initially envisaged. All persons aware of the Tribunal’s dealings will be aware of the initial order whereby Mr. Haughey’s evidence was to be taken in public in half-day sessions. Following further medical matters that were brought to the Tribunal’s attention, the order was made to vary that regime by having Mr. Haughey’s evidence heard in private by way of examination on deposition. This involved some 20 days of hearings in that regard and I think it likely that Counsel, in his Opening, may refer in somewhat more detail to the relatively elaborate procedures that were necessary in sustaining this regime on a daily basis. In addition to the actual hearing of the examination, further medical matters transpired which occasioned meetings and much correspondence, and in due course, I think it likely that the correspondence detailing what took place in this regard will be placed on the official Tribunal record. Secondly, as regards the matters that have arisen which appear to pertain to the terms of reference dealing with Mr. Michael Lowry, it is, I think, an undoubted fact that many of these matters have only come to the Tribunal’s attention within the last period of approximately two months. They have proved to be extremely detailed and have required the most painstaking attention by way of meetings and preparation of statements. In addition, the Tribunal has been obliged to observe fully the procedural requirements that have been laid upon it by law and this process has also proved to be quite tortuous, time consuming and exhausting. For all of that, I acknowledge that matters have proceeded to a lengthier degree than was anticipated. I am conscious that whilst this Tribunal must properly fulfil the role conferred on it by the Oireachtas, it must not drag on indeterminately or exceed its proper life-span. Accordingly, while matters have proceeded longer than I would have anticipated or wished, I am determined that the hearings will not occupy a day longer than is absolutely necessary to conclude the Tribunal’s business. What then remains as regards the future of the Tribunal? Firstly, there will be the sitting that commences with today on the two matters that I have alluded to. Secondly, it will be necessary to hear some evidence by way of tidying up loose ends or unresolved matters and, whilst the vast preponderance of persons having dealings with the Tribunal and their professional advisers have been affording admirable and proper cooperation with this Tribunal, the very small minority of persons who take the view that they should afford less than full cooperation with the Tribunal’s ongoing inquiries will have to live with the proper consequences of any such default. Third, there will be the question of evidence being adduced in relation to certain acts or decisions within the meanings ascribed to them in the Terms of Reference of the Tribunal. As it transpires, the evidence that will be adduced in the latter part of next week as a probability, may allude to certain aspects of acts or decisions, but it will be necessary to hear further evidence in relation to the overall matter of acts or decisions. The Tribunal has already undertaken very extensive work on a number of such particular acts or decisions, having considered and taken the view that some that were investigated confidentially failed to reach the required threshold of proceeding to full public sittings. That work is ongoing and evidence relative to such acts or decisions, as it is proposed to go public upon, will be adduced at the earliest feasible vantage point. That then leaves the matters of submissions that may require to be heard by the Tribunal, particularly in relation to the by no means inconsequential Terms of Reference relating to recommendations which the Tribunal is required to direct its attention to. On conclusion of the hearing of such submissions, and all other evidence on the basis that I have outlined, the Tribunal will proceed to prepare and finalise and publish its report as soon as conceivably possible. I stress the obvious in saying that whilst I have done my level best with the assistance of my legal team to prepare summaries and memoranda of the many fields of evidence that have been heard already, it would be inherently wrong to have even embarked upon writing the report until all relative evidence has been heard and all appropriate submissions listened to by the Tribunal. The last matter that I wish to allude to, before Counsel for the Tribunal makes his opening address, relates to certain of the procedures which have become necessary in the context of the reading of Mr. Haughey’s examination on deposition. In the course of that examination, he made some observations and deposed to certain matters relating to acts or conduct on the part of a limited number of other persons who have already testified at public sittings. It is, of course, accepted by the Tribunal that the normal procedural sequence in the conduct of a Tribunal of Inquiry as enunciated by the Supreme Court in the case of Haughey & Ors. v Moriarty & Ors. contemplates the service of relevant intended evidence on interested persons followed by the public hearing of such evidence, with an opportunity to cross-examine by or on behalf of such interested persons being afforded. Clearly, this intended sequence is predicated upon the availability of witnesses who are capable of testifying viva voce in public, and who have furnished advance statements of such intended evidence. The situation encountered by the Tribunal was that during the currency of Mr. Haughey’s public sworn testimony, it was conveyed that he was suffering from so serious a degree of disability on health grounds that, following exhaustive inquiries, it was resolved that the only feasible method of proceeding with and concluding his examination was by way of deposition on commission. Since, in addition, no statement or memorandum of Mr. Haughey’s intended evidence had been made available to the Tribunal, it is accepted that the practical consequences of this procedure were that certain such interested persons neither had advance notice of the relevant matters alluded to by Mr. Haughey, nor had then the opportunity to cross-examine in regard to these. The Tribunal fully appreciates the misgivings that may be felt by some such persons. However, much recent case law has lain appreciable stress upon the need to afford to Tribunals of Inquiry reasonable latitude and flexibility in the conduct of their procedures, provided this is not inconsistent with fair procedures. In setting forth the sequence of procedures referred to a few moments earlier, the Tribunal is of the view that the Supreme Court was setting forth norms ordinarily applicable to the work of Tribunals rather than directing an immutable sequence or course of conduct to be rigidly adhered to in all contingencies, even upon the occurrence of circumstances so exceptional as occurred in the present instance. In ordinary litigation in the courts, it is not infrequent that witnesses may die, may suffer from disability or be otherwise unavailable for testimony, leaving cases to be concluded without the opportunity of relying upon, or impugning in cross-examination, such witnesses’ evidence. Having regard to all these circumstances and having discussed and corresponded in relation to these matters with some of those interested persons, the Tribunal has taken the view that it is not disposed to exclude any particular portions of Mr. Haughey’s examination that may have arisen in this regard, but is disposed to admit it upon terms, however, which it is believed will obviate any remaining substantive likeliness of unfairness. These involve, firstly, that immediately after the reading of the deposition at public sittings, the relevant interested persons will be enabled to adduce testimony in response. Secondly, that counsel for the Tribunal, in his Opening Statement preceding the reading of the deposition, will specifically refer to the contingencies that has arisen in this regard and the provisions made to deal with it. And thirdly, that I, as Sole Member, in considering any conflict of testimony that may be involved, will have due regard to all the relevant, evidential and other circumstances surrounding this. That essentially, ladies and gentlemen, concludes the introductory remarks that I felt appropriate at this juncture and I would now call on Mr. Coughlan, if he would please do so, to open this new phase of sittings on behalf of the Tribunal. MR. COUGHLAN: These sittings of the Tribunal come after a significant break required to conduct an examination of Mr. Charles Haughey by way of commission. At the sittings, it is proposed to deal with the material garnered during the course of that commission, and, in addition, to deal with the results of other work conducted by the Tribunal in the course of its private investigations over the past month or so, notably, in connection with those aspects of the Terms of Reference dealing with Mr. Michael Lowry. We intend to deal, firstly, with the conduct of, and the steps the Tribunal now proposes to take, in relation to the commission and then, to deal with material relating to the Terms of Reference which refer to Mr. Michael Lowry. The examination of Mr. Haughey on commission, that is, in a private setting, has already been mentioned in the course of Opening Statements and has also been mentioned by the Sole Member in the course of Public Statements. The commission was necessitated by certain health considerations which would have made it extremely difficult, if not in certain circumstances impossible, to continue the examination of Mr. Haughey at the Tribunal’s public sittings. The manner in which the Tribunal proposed to proceed in relation to the carrying out of this examination has already been mentioned. For the purposes of the commission, a set of rules and procedures were enunciated. This was amplified both at the commission and in the course of correspondence with Mr. Haughey’s lawyers. Ultimately, these rules and this proposed procedure had to be modified as the examination proceeded in the light of the circumstances surrounding Mr. Haughey’s state of health. The pattern which developed was that Mr. Haughey attended for one hour each day on which it was decided to conduct the examination. Prior to most of these attendances, the Tribunal wrote to Mr. Haughey’s solicitors indicating the main areas it was intended to deal with at the private sittings. With each letter of this kind, the Tribunal also sent a book of documents. In these letters, and in the book of documents, the Tribunal endeavoured to provide Mr. Haughey’s advisers with an abridgement of the matters which had already been extensively set out in lengthy correspondence over the previous two and a half years. The books of documents contained an abridgement or distillation of documentation which had already been brought to the notice of Mr. Haughey and his advisers since the Tribunal first embarked on its work. In total, the commission sat for 20 hours on 20 separate days over a period of approximately three months. While Mr. Haughey attended for all these sittings, it wasn’t possible during the course of the sittings to obtain 20 hours of deposition. This was due to the fact, as might be expected, that from time to time legal submissions were made and objections taken to the line of questioning. In all, therefore, the 20 days of examination produced a little less than 20 hours of testimony. What is now proposed is to adopt the transcript of the examination of Mr. Haughey as part of the evidence of the Tribunal. This will entail reading into the record of the Tribunal so much of the material as it has been decided to adopt as evidence. Certain parts of the examination have been excluded as being inappropriate to be adopted as part of the evidence and Mr. Haughey has been put on notice, through his advisers, of the extent to which it is proposed to read the transcript into the record. I should emphasise, however, that that portion of the transcript of the commission which has been excluded comprises a very, very minor part of the transcript of the depositions. CHAIRMAN: I think that is the case, Mr. Coughlan, and, in fact, it primarily relates to legal argument in relation to which rulings were made by me and I think there may have been one very limited portion of evidence in relation to which an objection may have been upheld on behalf of Mr. Haughey. Turning now to substantive matters by way of introduction. I propose to set out briefly Mr. Haughey’s responses to the main queries taken up with him in relation to the aspects of the Terms of Reference and the deposition given in relation to those aspects of the Terms of Reference over and above the queries addressed to Mr. Haughey in the course of public sittings in this hall. The first matter dealt with was the operation of the account known as “Leader’s Allowance Account” or the “Party Leader’s Account”. This account was kept with Allied Irish Bank, Baggot Street in the name of Messrs. Charles Haughey, Ray MacSharry and Bertie Ahern. It will be recalled that this was the account into which the Party Leader’s Allowances paid out of Exchequer funds to the Fianna Fail Party leader was lodged. The Party Leader’s Allowance paid to the various party leaders are intended for the political purposes of the different parties in the Dail and are mostly used for research, legitimate political parliamentary activity and so on. For obvious reasons, the amounts paid to a political party are larger when the party is in opposition than the amounts when the party is in power. That is, because when the party is in opposition, it lacks the resources of the Civil Service to promote its political programme. The allowances are paid in instalments. In the period with which the Tribunal is concerned, the allowance was paid in twelve monthly instalments. Evidence has already been given in relation to the operation of this account by a Mr. Patrick Mackey, an official of the Department of Finance, Ms. Eileen Foy, Ms. Catherine Butler, Mr. Bertie Ahern, Mr. Sean Fleming and Mr. Alan Kelly, an official of Allied Irish Banks. The day-to-day administration of the account in the course of Mr. Haughey’s leadership of the party appears to have been carried out by Ms. Eileen Foy. He gave an account of the procedure she followed. Broadly, the account operated in this way: On invoice was raised; the invoice was checked by Ms. Foy; a cheque was prepared to meet the invoice; the cheque was signed by one of the co-signatories; the invoice, the cheque and any necessary covering letters were then brought to Mr. Haughey for his signature; the cheque and the supporting documentation were then returned to Ms. Foy whose job it was to remit the cheque to the relevant payee; the payee of each cheque was recorded by Ms. Foy on the cheque stubs; Ms. Foy entered the transactions in the ledger and then she filed the invoices. From time to time, because of pressure of business, Ms. Foy encountered difficulties in arranging for the two signatures to be applied to the cheques. This caused delay in the administration of the activities paid for out of the account. In particular, there were times, according to the evidence of Ms. Foy, when she found it difficult to make contact with Mr. Ahern because of his commitments and therefore, was unable to secure his signature to enable the cheque to be paid promptly. In order to avoid delays, therefore, a practice developed whereby Mr. Ahern would pre-sign blocks of cheques in advance. These would then be used by Ms. Foy as and when it became necessary to deal with particular invoices. The Tribunal’s interest in this account was prompted by a lodgment to Guinness & Mahon of a cheque for £25,000 drawn on the Leader’s Allowance account. This cheque was made payable to cash and appears to have been paid out of a block of cheques pre-signed by Mr. Bertie Ahern. It was credited to an account of Amiens Securities. The Amiens Securities accounts appear to have been under the control of the late Mr. Des Traynor and, in this case, the lodgment was to an account used to fund the bill-paying service then operated by Haughey Boland on behalf of Mr. Haughey. From the Tribunal’s examination of the account, and from evidence given in relation to the account, it appeared that there were substantial lodgements to the Leader’s Allowance account over and above the Exchequer payments. Evidence has also been given that significant disbursements from this account, including the disbursements just mentioned for £25,000 payable to cash, did not appear to be connected with any political activity, or with a type of political activity, which seems to have been contemplated by the account. In the course of his examination, Mr. Haughey agreed with the broad outline of the evidence given in public concerning the operation of the account. He indicated, however, that he knew nothing of the practice of the pre-signing of blocks of cheques in advance. He agreed with the evidence of Ms. Eileen Foy in relation to the manner which the day-to-day calls on the account were processed. Where the records of accounts were concerned, it will be recalled that Ms. Eileen Foy gave evidence that after she ceased to operate the account, that is on the cessation of Mr. Haughey’s role as leader of the party, she sent certain records to Fianna Fail’s headquarters in Mount Street. Mr. Haughey was asked whether he had any knowledge of any other records and he indicated that he held no records and that he took no records in relation to the account after he ceased to hold office. It will be recalled that considerable difficulties arose in the course of the public sittings of the Tribunal concerning the records of the administration of the Party Leader’s Account. In the course of evidence to the Tribunal, Ms. Foy indicated that after she left office, she had no knowledge of what happened to the ledgers in which she kept the accounts relating to the Party Leader’s Allowance or the invoices processed through the account. She did indicate, however, that she recalled that the contents of Mr. Haughey’s office were put into boxes as part of his move out of the Taoiseach’s office, but that she did not know specifically if any of these items, that is the ledgers and invoices, were included in the boxes and she had no further knowledge of what happened to the boxes or their contents. She had the impression that some of the material may have gone to Fianna Fail. She gave evidence that when requested by the Tribunal to assist with its inquiries, she went to see Mr. Haughey and she told him that she had been asked about the operation of the account and pointed out that she had no records and she inquired whether he had any records. Her evidence was that the response she got from Mr. Haughey was that she really didn’t get an answer. In the course of his examination, Mr. Haughey had difficulty with this evidence and, in fact, indicated that after Ms. Foy had given evidence, she came to see him once again. He asserted that she said to him that she was confused and that, in giving this evidence, she thought she was answering a previous question. Mr. Haughey, in his examination, informed the Tribunal that he then said to Ms. Foy, “Will you please, therefore, get your solicitor to write to the Tribunal and explain that to them.” He said that he didn’t know whether her solicitor had done that and that he had a clear recollection that she said she was confused and that she thought she was answering a previous or different question. Mr. Haughey made these statements in the course of his examination on the 19th January, 2001. The Tribunal took up the matter with Ms. Foy and she has since made a supplemental statement to the Tribunal and will be giving evidence concerning this matter. And this would be one of the class of persons referred by you, Sir, as falling into the procedure now being adopted by the Tribunal in that regard. Ms. Foy has informed the Tribunal that she recalls calling to see Mr. Haughey after she had given evidence at the public sittings in July of 1999; that, in general, the conversation was centred around the difficulty she had in being asked about matters that had taken place some ten to twenty years ago, as she put it, and how glad she was it was all over. She has stated that in the course of conversation, Mr. Haughey may have mentioned that she had made a mistake in saying, “I didn’t really get an answer,” and that this might be clarified. She did not recall saying that she was confused in this regard, nor does she recall Mr. Haughey specifically asking her to get her solicitor to write to the Tribunal. She did not recollect that there was any degree of emphasis placed on the matter. She has also stated that regarding the remark that she had said to Mr. Haughey that she was confused, her recollection is that she made this remark while they discussed, in general terms, the questions she was asked about the various cheques. In view of the fact that the Tribunal’s attention was first drawn to this account in connection with the cheque dated 16th June 1989 for £25,000 made out to cash, it was decided to take this matter up with Mr. Haughey at an early point. The routing of the cheque, to which I have just referred, was brought up with Mr. Haughey. He was informed that Ms. Foy had stated in evidence that she had no dealings either with Guinness & Mahon or with the late Mr. Des Traynor. She had indicated that the first time she had become aware that the cheque had ended up in an Amiens account in Guinness & Mahon was when the Tribunal brought it to her attention. Mr. Haughey stated that he had no recollection. It was suggested to him that in view of the fact that the cheque had been lodged to Guinness & Mahon on the 20th June, and further in light of the fact that Ms. Foy did not lodge it or give it to the late Mr. Desmond Traynor, that he, Mr. Haughey, was probably the only person who could have made the lodgment. He indicated that he had never made a lodgment to a bank in thirty years. When it was suggested to him that the lodgment might not have been made by him, but rather through him, he again indicated that it could not have been through him and he didn’t know how it could have ended up in an account controlled by the late Mr. Traynor. He indicated that he had no recollection of ever giving a cheque of that kind to Mr. Traynor. Mr. Haughey stated that he had mentioned the matter to Ms. Foy and that Ms. Foy had speculated that the cheque might have gone to Mr. Brian Lenihan to meet his personal expenses. When the Tribunal drew this statement to the attention of Ms. Foy, she mentioned that she discussed this at her meeting with Mr. Haughey on the 20th January, 2001, and that it was canvassed by her purely as a possibility. She has informed the Tribunal that cash payments may have been made to the late Mr. Brian Lenihan, that she had thought all along that Mr. Lenihan had received funds, but that she had nothing to base this on. It is important to bear in mind that Ms. Foy has given evidence that she never gave any cash to Mr. Lenihan or to anyone else and her suggestion, therefore, which, as she says herself is not based on anything, that Mr. Lenihan may have received £25,000 in cash is pure speculation. The Tribunal has raised this matter not in the context of any inquiries it might pursue with a view to ascertaining whether Mr. Lenihan received £25,000, but solely as to put the speculation being canvassed by Mr. Haughey in context and in such a way as to ensure fairness to the late Mr. Lenihan and his family. Next, the Tribunal took up with Mr. Haughey certain lodgements to the Leader’s Allowance account in 1986 over and above the instalments of the payments from the Exchequer. There were two lodgements of £50,000 each, the first on the 7th April 1986, and the second on the 22nd October 1986. In all, some £100,000 was lodged to the account by way of two Irish Permanent Building Society cheques, each payable to Fianna Fail. The cheques were endorsed by Mr. Charles Haughey. Mr. Haughey stated that he could give little or no assistance; that he had no recollection of approaching Mr. Farrell for any such contributions, but he did say that Mr. Paul Kavanagh had told him that Mr. Farrell was one of the people anxious to assist or prepared to assist him personally/politically, to assist him in a political sense because he was a firm believer in what Mr. Haughey was trying to do and wanted to be part of it. Mr. Haughey took the view, in his examination, that there was no distinction between support in the form of personal political support, political support, that is in a party context, or personal support. He did point out that neither Edmund Farrell nor the Irish Permanent Building Society ever sought preferences or favours or concessions. Mr. Paul Kavanagh has informed the Tribunal that he recalls being in the Shelbourne Hotel with Dr. Farrell and a Mr. Patrick Kevans before the 1987 election and that Dr. Farrell was stressing the necessity of ensuring that Mr. Haughey was elected. According to Mr. Kavanagh, Dr. Farrell also stated that with Mr. Haughey’s type of life-style, people would have to support him personally and Dr. Farrell wondered how Mr. Haughey could be helped out with his personal expenses. Mr. Kavanagh told the Tribunal that he informed Mr. Charles Haughey following that incident that he should deal directly with Dr. Farrell in terms of fundraising as Mr. Haughey himself was likely to secure more generous donations than Mr. Kavanagh was. Mr. Patrick Kevans has informed the Tribunal that he has no recollection whatsoever of any such meeting in the Shelbourne Hotel in 1987, or of any discussion with Mr. Kavanagh or Dr. Farrell in relation to Mr. Charles Haughey’s life-style or how he could be supported financially. Mr. Kevans was a member of the Board of the Irish Permanent Building Society in 1986 and he says he has no recollection of any payments or donations made to or for the benefit of Mr. Haughey by Dr. Farrell and he has no recollection of any other payments or support provided to Mr. Haughey. Mr. Farrell has no recollection of any meeting with Mr. Kavanagh at the Shelbourne Hotel but he cannot say that no such meeting took place. To the best of his recollection, he met Mr. Paul Kavanagh once when on route to dinner with Mr. Patrick Kevans and another director of the Irish Permanent. Dr. Farrell accompanied Mr. Kevans when he called on Mr. Paul Kavanagh at Mr. Kavanagh’s Merrion Square office. Dr. Farrell says nothing of moment was discussed in Dr. Farrell’s presence and after a short interval, Mr. Kevans and Dr. Farrell proceeded to their other engagements. Dr. Farrell has, however, told the Tribunal that if a meeting, whether by appointment or casually, of the kind mentioned by Mr. Paul Kavanagh occurred, then he has no recollection of ever being informed of Mr. Haughey’s life-style or insufficiency of funds to support it and indeed it appeared to him (Dr. Farrell) that Mr. Haughey was a wealthy person. Dr. Farrell has confirmed that he would have wished to see a Fianna Fail government elected but he did not think that Mr. Haughey was in danger of losing his seat. Dr. Farrell does point out that Mr. Haughey approached him directly on two occasions, once in relation to Mr. Haughey’s own election campaign fund which was in 1989, and once also in 1989 in relation to the funds set up to defray the medical expenses of the late Mr. Brian Lenihan. Mr. Haughey was next queried in relation to a cheque dated 16th August 1991, again drawn on the account of the Irish Permanent Building Society and in the amount of £40,000. It was payable to Fianna Fail and was once again endorsed by Mr. Charles Haughey and was lodged to the Party Leader’s Account. This cheque was drawn by the Irish Permanent Building Society in a year in which local elections occurred. Mr. Haughey doesn’t remember soliciting the cheque and does not know how it got to the Party Leader’s Account. While no receipt was given to the Irish Permanent Building Society, Mr. Haughey said that this would have been a matter for Ms. Eileen Foy. Returning now to 1989, the Tribunal took up with Mr. Haughey three payments made by Dr. Farrell in connection with various fundraising activities. Firstly, a payment of £20,000 payable to Mr. Haughey the fund to defray the medical expenses of the late Mr. Lenihan. The cheque was dated 7th June 1989. Another cheque for £10,000, also dated 7th June 1989, was intended for Mr. Haughey’s personal campaign in the 1989 general election and a further cheque for £65,000 payable to Fianna Fail and dated 7th June 1989 was intended for Fianna Fail funds in general. The latter cheque was, in fact, transmitted to Fianna Fail Headquarters in Mount Street and receipted. Both the £10,000 cheque and the £20,000 cheque were endorsed by Mr. Haughey. He acknowledged his signature. He stated, however, that he had no recollection of soliciting the cheques. Evidence has been given that these cheques were lodged to a Celtic Helicopters account at the Dublin Airport branch of the Bank of Ireland. This happened, it would appear, sometime around the time of the general election in that year. Subsequently, on the 21st June 1989, a cheque in the sum of £30,000 payable to cash was drawn on Celtic Helicopters account in that branch. Mr. Haughey indicated that he had no knowledge of how the two Irish Permanent cheques came to be lodged to a Celtic Helicopters account. He also stated that he knew nothing about the drawing of a Celtic Helicopters cheque in the sum of £30,000 payable to cash. Evidence has been given that the cheque for £30,000 was cashed over the counter at the AIB Baggot Street branch, that is the branch in which the Party Leader’s Account was held. Mr. Haughey appears to be somewhat perplexed as to how this cheque was dealt with. He indicated personally that if this cheque was cashed and not lodged, then the money must have been used for some Fianna Fail purpose or for some Party Leader’s purpose. When queried as to what Fianna Fail purpose would warrant a cash payment of £25,000 in 1989, he responded that perhaps people dealing with the party were looking for cash. Ms. Foy has given evidence on a number of occasions in relation to cash transactions, indicating that she did not pay suppliers in cash. When this matter was specifically drawn to her attention, she was not able to take it very much further, other than to point out that in matters of this nature, that is cashing a cheque of this magnitude, that she did not operate on her own initiative and would have received instructions from Mr. Haughey. Mr. Haughey was then asked whether he ever reviewed the position since matters moved on in the Tribunal and he indicated that he hadn’t. When asked why he hadn’t reviewed the position, he said he couldn’t see the necessity to do so. In light of the evidence given to the Tribunal that the £30,000 cheque from Celtic Helicopters was not, in fact, lodged to the Party Leader’s Account but was cashed at AIB Baggot Street, Mr. Haughey was asked in the course of his examination how the £20,000 of that money, which had been subscribed on the basis that it was for the assistance of Mr. Lenihan, had been expended. He couldn’t provide the Tribunal with any assistance. Mr. Haughey’s statement that the matter had been investigated by his accountant, Mr. Des Peelo, was brought to the attention of Mr. Peelo. Mr. Peelo, again, is in that class of witnesses, Sir, who will require to avail of the procedure which you spoke of earlier. “Re the cheque of £30,000. [It’s dated 18th June 1989, that is the date on which it was drawn.] At the request of the client [who was Mr. Haughey], it is my recollection that I phoned the bookkeeper of Celtic Helicopters Ltd. to request details from the Bank of Ireland, Dublin Airport branch, to obtain details re the payment of the £30,000 cheque drawn on the Celtic Helicopters account at the bank. “I received a fax from Celtic Helicopters Ltd. on the 21st July 1999. The letter referred to the cheque being lodged. My recollection is that the client confirmed to me that he was not aware of any account connected to him in AIB, 1/3 Lower Baggot Street, Dublin 2, apart from the Party Leader’s Account. “It is my belief that the client may have relied on the Bank of Ireland letter of the 21st July 1999 in issuing the public statement. Next, Mr. Haughey was queried in relation to a sum of approximately £12,500 paid in respect of expenses which had been incurred on Mr. Lenihan’s behalf by the Department of Defence. Evidence has been given that Mr. Spain of the Department of Defence was pressing for payment in 1991. Mr. Paul Kavanagh has given evidence to the Tribunal that Mr. Haughey asked him to make one further fundraising effort for Brian Lenihan, that specifically he asked him to raise £50,000. Mr. Haughey’s response to this evidence was that he had no specific memory; no memory of raising £50,000, though he did have a memory of the “general situation”. He indicated that he recalled that Ms. Foy came to him indicating at one point that the fund was finished and that there was no more money in it and that when this additional need came up, he is almost certain that he would have called in Mr. Paul Kavanagh. When queried as to why, when there was a need for only £12,000 approximately, he requested Mr. Kavanagh to raise £50,000, Mr. Haughey had no answer. Mr. Haughey’s overall response was that he had not either deliberately or otherwise diverted any monies intended for Mr. Brian Lenihan’s medical expenses and he asserted that all funds subscribed were expended one way or another on behalf of Brian Lenihan. Mr. Haughey was then queried in relation to the evidence given by Mr. Mark Kavanagh concerning a payment of £100,000. £25,000 was by way of a cheque made payable to the Fianna Fail and intended, according to Mr. Kavanagh, to be by way of a contribution to the late Mr. Brian Lenihan’s medical expenses. The balance was made up of three drafts made payable to cash, each in the sum of £25,000. The evidence of Mr. Kavanagh was that the total amount of £100,000 was handed over to Mr. Haughey at his home at Abbeville on the 15th June 1989, the day of the General Election. Mr. Kavanagh recalled that, in particular, he remembered driving across Dublin early on the morning of the Election to meet Mr. Haughey, at about nine o’clock or thereabouts, at his home to hand over the money. In his examination on commission, Mr. Haughey has stated that he is as certain as he can be of anything else that he did not meet Mr. Kavanagh at 9.30am on polling day 1989. He asserted that there was no approach for such an appointment and that, if there had been, it would have been dismissed out-of-hand; that as far as he is concerned, the meeting described by Mr. Mark Kavanagh never happened; that it did not happen on the 15th and he has no recollection of it happening on any other day. In the course of examination, Mr. Haughey was taken through the somewhat involved trail over which the monies handed over by Mr. Kavanagh passed. It will be recalled that the cheque for £25,000 intended, according to Mr. Mark Kavanagh’s evidence, as a contribution to the Brian Lenihan fund, was, in fact, transmitted to Fianna Fail Headquarters at Mount Street as a political donation. The three drafts for £25,000 each were lodged to Guinness & Mahon bankers. Two of those drafts were exchanged for a single draft in the sum of £50,000 payable to cash. This draft for £50,000 was then transmitted to Fianna Fail Headquarters in Mount Street but characterised in their records as a political contribution by Dr. Michael Smurfit’s organisation. The other draft for £25,000 was lodged to an account in Guinness & Mahon and eventually drawn down in two tranches of £20,000 and £5,000. Mr. Haughey responded that he knew nothing about any of these transactions. Because of the connection between this payment and the evidence given by Dr. Smurfit and a payment solicited from him in connection with the same election, Mr. Haughey was queried in relation to the Smurfit contribution; in particular, the fact that according to Dr. Smurfit, it was solicited by Mr. Haughey himself; that the money was to follow a route dictated by the late Mr. Desmond Traynor; that, in fact, the money was paid out of an account in Monaco Trust, where it was routed to London and ultimately credited to an account of Ansbacher in London. Mr. Haughey’s response was that he could say “very firmly” that the late Mr. Traynor would never and never did collect money for Fianna Fail. When asked, therefore, whether this was or would have been a personal contribution, he indicated that he couldn’t say that. He simply didn’t know and to the best of his own knowledge, he did not approach Mr. Smurfit. The £50,000 contribution to Fianna Fail which was remitted to the Fianna Fail Headquarters at Mount Street and characterised as a political contribution from Dr. Michael Smurfit was recorded by Mr. Sean Fleming as having been received ‘per An T’, meaning per An Taoiseach. Mr. Haughey indicated that at election time, he wouldn’t have been physically handling matters and that this may have been an expression that Mr. Fleming used to mean that a payment was coming from the Taoiseach’s office; that it may have been from Ms. Eileen Foy. It was pointed out to Mr. Haughey that the payment was a confidential one and when queried as to how she would have known whether to make a payment confidential, his response was perhaps Mr. Paul Kavanagh had directed her to send the money to Mount Street informing her that it was confidential. When it was suggested that the only route by which the Mark Kavanagh money could have arrived at Guinness & Mahon was by way of the late Mr. Des Traynor and Mr. Charles Haughey, Mr. Haughey responded that this was ridiculous. When dealing with the evidence that the late Mr. Traynor was involved in the routing of the payment from Dr. Smurfit, Mr. Haughey indicated that he was fairly sure that the late Mr. Traynor would not have operated in the political domain, that is as a fundraiser or otherwise acting on behalf of Fianna Fail. Mr. Haughey knew nothing about Mr. Traynor’s approach to Mr. Smurfit to assist the contribution to Mr. Haughey’s personal financial needs. He also stated that Mr. Traynor had never told him of the international routing of the Smurfit contribution which arrived at Ansbacher’s account in London. It was drawn to his attention that Dr. Smurfit had given evidence that he was contacted by the late Mr. Traynor after the payment had been made to confirm its safe arrival and, again, Mr. Haughey indicated that he knew nothing of this contact. Evidence was given in connection with the operation of the Leader’s Allowance Account of two payments to Mr. John Ellis TD in 1989 and 1990 respectfully. On the 13th December 1989, he was given £12,400 in cash. On the 23rd March 1990, he was given a further £13,600 in cash. Each of these payments, the funds for which were debited to Leader’s Allowance account were prompted as a result of bankruptcy. These were threats which Mr. Ellis was facing — if they had been carried out by his creditors, this would have resulted in the loss of his seat. Mr. Haughey took the view that this was a crisis of political life and death and on that basis the payments were warranted. It was not possible, in the course of the examination, to put every single drawing from the Leader’s Allowance Account to Mr. Haughey. Nor indeed, it was possible in the course of the examination to put to Mr. Haughey every single financial transaction in respect of which evidence had been given in the course of the Tribunal’s public sittings. It was recognised that Mr. Haughey could not be expected to remember the details or the fact of individual transactions over a long period of time. This difficulty arose in connection with the operation of aspects of the Leader’s Allowance Account and, at a later point in the course of the examination in connection with the operation of the bill-paying service and the Amiens account under the control of the late Mr. Desmond Traynor. And then Mr. Haughey said it would work the other way. If he expended monies once behalf of the Party, which he would very often do, that the balance would be struck and he would either owe the Party Leader’s Account money or it would owe him money, and that’s the way things were. And it was Eileen Foy’s duty, more or less or function, to make sure that the ongoing balances were maintained in regard to the Party Leader’s Account. Mr. Haughey went on to say that one side of the balance would be those items which could strictly be attributable to him as a person and on the other side would be those items where he had expenditure on behalf of the Party. He indicated that this may be quite indefinite, such as entertaining at Abbeville or travelling expenses, or that sort of thing, but that the idea was that a broad balance would be kept and that it would be achieved by Eileen Foy. Having described the operation of the Leader’s Allowance Account in that way and in particular with reference to matters which were personal as opposed to political, Mr. Haughey was asked once again concerning the cheque for £25,000 made payable to cash dated 16th June 1989, which was lodged to Guinness & Mahon bankers and credited to an account of Amiens Securities, an account which was under the control of the late Mr. Des Traynor and for which payments were made to the Haughey Boland No. 3 account. The Haughey Boland No. 3 Account was the account from which the bill-paying service was operated. Mr. Haughey was queried as to whether this could have been a reimbursement to him. Mr. Haughey felt that this may have been the case but he thought it unlikely. Mr. Haughey was then queried in relation to a number of other drawings which appear to be connected with the Haughey Boland bill-paying service. In particular, he was referred to a debit to the account on the 29th April 1986 in the sum of £10,000 which appeared to relate to a credit to the Haughey Boland bill-paying service account on the 25th April of that year. Mr. Paul Carty has given evidence that there appears to be a relationship or match between these two transactions. Mr. Haughey was not able to be of any assistance to the Tribunal in relation to the apparent relationship between the transactions. When similar transactions were brought to his attention, including a debit to the Party Leader’s Account of £25,000 on the 29th October 1986, apparently connected to a credit to the Haughey Boland No. 3 Account on the 28th October of that year, his response was that he didn’t agree that the payments were connected but that, if they were, in his view the most likely explanation was that they were reimbursements for something which he had expended on behalf of the Party. Mr. Haughey indicated that apart from reasonably significant items, the reimbursements would not occur on an item-by-item basis but that a broad reconciliation would have taken place periodically and he indicated that he thought that Eileen Foy and Catherine Butler would confirm the position. Mr. Haughey was queried how his balance would be met when he was found to be indebted to the party Leader’s Allowance Account. He indicated that he wasn’t too sure how any such debit balance would be funded, but assumed that it would come from his own resources or through the bill-paying operation. He indicated that he couldn’t recall how he would clear the balance but thought that the bill-paying service was the obvious source. Ms. Foy was not able to provide any information in relation to Mr. Haughey’s view as to this aspect of the operation of the Leader’s Allowance Account. Ms. Butler was not aware that Mr. Haughey sought reimbursement on the Party Leader’s fund in relation to the use of Abbeville as a hospitality facility and she has informed the Tribunal that she never encouraged Mr. Haughey to seek such reimbursements. She herself never kept an ongoing balance in relation to such hospitalities and does not recall whether or not Ms. Foy kept any such information, though she does point out that Ms. Foy rarely discussed financial matters in any detail with her. She has also stated that she was aware that Mr. Haughey reimbursed the Party Leader’s fund for money expended on his behalf, but stated that she had no involvement in such reimbursement and had no involvement in maintaining any balance in the Party Leader’s funds and Mr. Haughey in respect of expenditure. When this matter was drawn to the attention of Mr. Sean Fleming TD, who at the relevant time was responsible for Fianna Fail administration as opposed to Fianna Fail parliamentary administration, he stated that neither he nor the Fianna Fail Party were aware and had no knowledge of the existence of a practice whereby a balance was maintained by Ms. Foy of expenditures of a personal nature incurred on Mr. Haughey’s behalf, nor was the Party aware that any personal expenditures incurred by Mr. Haughey were paid for out of the account into which the Party Leader’s fund was lodged. While it would appear that there was a system whereby expenditure incurred by Mr. Haughey, such as expenses incurred in entertaining at Abbeville, were reimbursed or, as more regularly happened, actually paid for by the Government, there appears to have been no record of any similar system operating with regard to purely Party activities. Mr. Haughey was queried in relation to what appeared prima facie to be expenditures on the Leader’s Allowance Account which could not be connected with any obvious political activity. A number of individual items were drawn to his attention. The first one was a payment of £2,400.90 on the 20th December 1990 by way of a cheque made payable to Adare Manor. Mr. Haughey stated that he had no recollection of it, but when queried whether Adare Manor could have been used for Party purposes, he responded that this was almost certain but that he didn’t remember. Ms. Butler has written to the Tribunal and has stated that she has already brought certain matters concerning the Charvet to the attention of Tribunal lawyers at a meeting at her solicitor’s office in the Autumn of 1999 and in that, in relation to Charvet, it was her recollection that on one occasion, possibly two, items were received from Charvet which incorporated what she took to be an invoice, and that on one occasion which she recalls, Mr. Haughey said words to the same effect used by Mr. Haughey in the course of his examination. Ms. Butler has been informed that her recollection of a meeting with Tribunal lawyers in which the matter of Charvet was discussed does not agree with the Tribunal’s record of what took place. Mr. Haughey was then asked to deal with a debit to the account by way of £4,532.81 payable to Le Coq Hardi on the 4th April 1991. Mr. Haughey indicated that he had no recollection of it, but that it would clearly be an entertainment of maybe a delegation of some sort, maybe a Party occasion or something like that. He also indicated that when deputations came down from the North of Ireland or, indeed, anywhere else, Abbeville might not be available and that these deputations would be brought to Le Coq Hardi. He indicated that this was probably the basis for all of the numerous Le Coq Hardi payments funded out of the Leader’s Allowance Account. Mr. Haughey was queried in relation to a number of cash cheques drawn on the account and in particular a cheque for £5,000 payable to cash drawn on the 4th April 1991. He indicated that he had no recollection of this, nor was he able to assist the Tribunal in relation to a cheque dated 11th September 1991 for £10,000 payable for cash. Similarly, he had no specific recollection in relation to the details of a number of other debits to the account. The question of the funding of the inception of Celtic Helicopters was taken up with Mr. Haughey on the 14th February 2001. It will be recalled that Celtic Helicopters was initially funded by borrowings from Guinness & Mahon on the one hand, and by funds provided by outside investors on the other. It would appear from the evidence given to the Tribunal that the outside investors put up about £80,000. Evidence was given that these outside investors included Mr. Joe Malone, Mr. Seamus Purcell and Mr. Cruse Moss, and Dr. John O’Connell. There was a suggestion from the evidence of Mr. Malone that Mr. PV Doyle may also have been an investor. There was also evidence that Mr. PV Doyle may have been involved with an investor or may have been connected with the initial capitalisation of the company. Mr. Haughey accepted that he had approached certain people to invest in the company. They were Dr. John O’Connell, Mr. Joe Malone, Mr. Seamus Purcell, and Mr. Cruse Moss. He indicated that he was nearly certain that he had not approached Mr. PV Doyle and that Mr. Doyle was not involved. He couldn’t remember whether Mr. Malone had been approached, not only as an investor, but also to become Chairman. He indicated that Mr. Malone could have been correct in his evidence when he informed the Tribunal that such an approach had been made. With regard to Dr. Michael Dargan, he stated that he was as certain as he could be that Dr. Dargan had nothing to do with Celtic Helicopters. It will be recalled that at the time Dr. Dargan, like Mr. Joe Malone, was associated with Aer Lingus. Mr. Haughey indicated that he had no recollection of any approach to Dr. Michael Smurfit and that, notwithstanding the evidence of Dr. Smurfit that he had been approached, Mr. Haughey indicated that it seemed to him unlikely. The investors identified by the Tribunal, they being Dr. John O’Connell, Mr. Joe Malone, Mr. Seamus Purcell and Mr. Cruse Moss, accounted for some £37,000 of the initial £80,000 investment. Mr. Haughey, when queried, indicated that he had no knowledge as to the other investors who would have accounted for £43,000 worth of the balance of the initial investment. Mr. Haughey stated that his involvement in securing investors was on the basis of personal friendship, asking these individuals, friends of his, would they be interested in taking up a share in the new company? He did state, however, that as far as he was concerned, Dr. Dargan never had anything to do with Celtic Helicopters and as he, Mr. Haughey, had certainly not approached him to make a contribution, and that it wouldn’t have entered his head to approach him because he wouldn’t have been on those sort of terms with him. He stated that Mr. Cruse Moss was associated with Mr. Malone. Mr. Haughey indicated that he had met him a couple of times and that it was Mr. Malone that brought in Mr. Cruse Moss. Mr. Haughey was also as confident as he could be that Mr. PV Doyle was not a contributor. Referring to Dr. John O’Connell’s involvement with Celtic Helicopters, Mr. Haughey was reminded that Dr. O’Connell had stated that in March of 1985 he was asked by Mr. Haughey to make a contribution to Celtic Helicopters and was also asked whether he had any friends who would make contributions. Mr. Haughey stated that he didn’t wish to get into a dispute with Dr. O’Connell as to what was or was not said with regard to what was Dr. O’Connell’s investment in the company and indeed whether it was an investment or whether, in other words, it was, as Dr. O’Connell believed, some kind of once-off contribution connected with him becoming a member of Fianna Fail. Mr. Haughey indicated that it would not be correct to suggest that it was a once-off contribution on Dr. O’Connell becoming a member of Fianna Fail. Mr. Haughey was queried and reminded that evidence had been given by a Mr. Curneen concerning a requirement the company had for an injection of funds. Evidence was given that Smurfit Paribas Bank was approached. Mr. Curneen gave that evidence in a meeting with Mr. Ciaran Haughey and Mr. John Barnacle, he noted that he had been informed that the company had three main shareholders, Mr. Ciaran Haughey, Mr. John Barnacle, and Mr. Charles Haughey. It was suggested to Mr. Haughey that this accounted for the unidentified balance of the investment in the company of its inception. Mr. Haughey indicated that in his view Mr. Curneen was mistaken and that he didn’t know how he could have got that impression. One of the aspects of the operation of the company dealt with in the examination on commission was the return to Dr. O’Connell of his initial investment, together with the return of £10,000, making a total repayment to him of £15,000. It will be recalled that evidence was given by Dr. O’Connell that he wrote to the company and that his correspondence was transmitted by Mr. Ciaran Haughey to his father on the basis that his father was the person to deal with Dr. O’Connell. It would appear that neither Mr. Barnacle nor Ciaran Haughey, who were the effective principals in the company, were ever consulted in relation to this payment of £15,000. Nor does it appear that any part of this £15,000 was actually debited to any account of Celtic Helicopters. Mr. Haughey was queried as to how the sum of £15,000 by way of return on investment was arrived at. He informed the Tribunal that Dr. O’Connell had told him that his accountants, that is Dr. O’Connell’s accountants, had valued the investment at £15,000 and that rather than have an argument on the matter, he agreed to pay it. His evidence was that he did not analyse the matter on a commercial basis, but on a basis of friendship. His view was that Dr. O’Connell had helped out when his investment was important and he was perfectly entitled to his money back and some appreciation. Of course, it will be remembered that the money did not come out of Celtic Helicopters and it would appear that it was sourced from an Ansbacher account. Mr. Haughey, in the course of his examination, agreed that as a matter of probability, he must have obtained that cheque from Mr. Traynor. It was suggested to Mr. Haughey that the whole affair was shrouded in secrecy and two features of this secrecy were highlighted in the course of his examination; the fact that the money invested went through an Amiens controlled account in Guinness & Mahon, and secondly, that when it was repaid, it was sourced in an Ansbacher account. Mr. Haughey did not agree that these features characterised the transaction as in any way a secret or covert one. When this portion of the examination of Mr. Haughey was drawn to the attention of Dr. O’Connell, the Tribunal received a letter from Dr. O’Connell’s accountants indicating that they had no involvement in the matter one way or another and that they were not involved in estimating or calculating the value of Dr. O’Connell’s investment. Dr. O’Connell provided no response to the Tribunal, other than to reiterate the evidence he had already given. Of course, in due course, it may be necessary to take up the matter with Dr. O’Connell, in that none of the evidence he has already given in any way addresses the issue as to whether he had informed Mr. Haughey along the lines outlined by Mr. Haughey in his examination. In 1992, Celtic Helicopters was in a perilous financial condition and it became necessary to refund the company. A number of individuals were approached and provided substantial funding. They were Mr. Xavier McAuliffe, Mr. John Byrne, Mr. Patrick Butler, Mr. Mike Murphy and Mr. Guy Snowdon. Mr. Haughey indicated that by this time he was taking a more active interest in Celtic Helicopters but informed the Tribunal in the course of his examination that he knew nothing about Mr. McAuliffe’s £50,000 contribution; that he had no recollection of Mr. John Byrne’s involvement; that he was aware Mr. Butler had made an investment but he wasn’t aware of the amount; that he knew nothing about the investment made by Mr. Mike Murphy with which Mr. David Gresty was associated. Mr. Haughey stated that he knew nothing about Mr. Guy Snowdon and that he had never heard of him, either from Mr. Traynor or anyone else, until his name was mentioned in the course of the Tribunal’s proceedings. He had no recollection that Mr. Malone had been approached once again in 1992 to make a further investment. Mr. McAuliffe’s investment was routed through offshore banks and ultimately transmitted to an Ansbacher account in Dublin in the Irish Intercontinental Bank. Mr. Byrne’s investment took an equally circuitous route involving offshore companies and then the main Ansbacher account in Irish Intercontinental Bank. The late Mr. Patrick Butler’s investment was made by way of Bank of Ireland draft for £35,000 payable to Celtic Helicopters. The Mike Murphy/David Gresty involvement again followed a particularly circuitous route involving offshore entities and the Ansbacher accounts. Mr. Haughey, although involved to some degree in assisting his son and partner in the company, knew nothing of these activities. When it was suggested to him that Mr. Traynor operated in a secret manner, Mr. Haughey’s response was that this was the Tribunal’s phrase and that Mr. Traynor was a very confidential person. This 1992 injection of capital was initially treated in the accounts of the company as loan capital. By 1996 the company needed to raise further funds and the bank wanted the 1992 injection off the balance sheet as loan capital. It was decided to convert the loan capital to preference shares. This, however, was done without reference to any of the people involved in making the investment. It would appear that none of them were made aware of the decision to convert the investment from loan capital to preference shares, nor were Messrs. Snowdon, Byrne, Butler, (by then of course it would have been his estate as he was deceased), or McAuliffe were aware that their loans had not only been converted into preference shares, but that these shares were being held for Larchfield Securities, a Haughey family company, and not for the original investors. When Mr. Haughey was queried about this, he knew nothing about the matter and felt that this was a matter which would have been dealt with by professional advisers and perhaps Mr. Traynor’s views which had been expressed at an earlier stage. Mr. Haughey accepted that the money for the bill-paying service must have been provided by the late Mr. Desmond Traynor. He was queried as to his knowledge of the source of the funds assembled by Mr. Traynor and, in relation to Mr. Ben Dunne, indicated that whatever he had stated in the McCracken Tribunal would be correct. In this connection, he was referred to his evidence to the McCracken Tribunal in which he mentioned a discussion he had with Mr. Traynor in 1993 in which Mr. Traynor mentioned that Mr. Ben Dunne had been a benefactor of his. When asked what exactly Mr. Des Traynor said, Mr. Haughey indicated that he didn’t remember. This matter was taken up with Mr. Haughey on a number of occasions with a view to ascertaining precisely the discussion which took place and whether, in the course of the discussion, Mr. Traynor had discussed other benefactors apart from Mr. Dunne. Mr. Haughey indicated that Mr. Traynor did not inform him of the identity of anyone else he had approached for funds. Mr. Haughey was asked if he was in a position to assist the Tribunal by way of expressing an opinion or speculating as to who might have been approached and he informed the Tribunal in the course of his examination that he was reluctant to so do, because he did not wish to have people become unnecessarily involved with the business of the Tribunal. Mr. Haughey was taken through the evidence relating to the operation of the bill-paying service. He disputed all of the evidence of payments from the Amiens account to the Haughey Boland No. 3 Account. When the figures going through the bill-paying service were drawn to his attention, such as the fact that, for instance, £189,000 went through it in 1985, £177,000 in 1986, £204,000 in 1987 and so on, his responses to these figures was that they were quite extraordinary and meaningless to him. The evidence given at the Tribunal’s public sittings concerning the bill-paying service suggested that an Amiens account under the control of Mr. Traynor was the immediate source of funding for the payment of bills with the exception of the year 1988. The Tribunal has been unable to ascertain the source of any money which went into Haughey Boland for the purpose of paying bills for that year. Mr. Haughey was not able to provide any information and had no idea as to where the money for the service came from in that year. Mr. Haughey was aware that the bill-paying service was taken over by Mr. Jack Stakelum in 1991 and that it continued to be operated by him up to 1996. During Mr. Traynor’s life, he was aware that Mr. Traynor played a particular role in providing or sourcing the funds for the service. When queried as to how the funds were sourced after Mr. Traynor’s death, he indicated that he had no idea, but assumed that Mr. Traynor left funds from which the bill-paying service could be supplied. These were the two significant instances in Mr. Haughey’s relationship which brought him into contact with Mr. Dermot Desmond. When he was asked whether by the Autumn of 1987 he would have developed a reasonable relationship with Mr. Desmond, such as it would have enabled Mr. Traynor to consider it appropriate to approach him for personal financial support, Mr. Haughey’s response was that he did not think it would have been as a result of his relationship with Mr. Desmond purely that Mr. Des Traynor would have approached him, but that Mr. Desmond was an important man at that time, financially speaking, and that he would certainly have been known to Mr. Des Traynor. Mr. Haughey informed the Tribunal that one could say that at that stage Mr. Desmond certainly became a supporter of his politically, because as Mr. Haughey supposed, in a way, the Government had adopted two of his proposals, one dealing with public finances and what needed to be done and the other was the proposal for the Financial Services Centre. When queried concerning his ongoing relationship with Mr. Desmond, Mr. Haughey stated that it evolved over a number of years. He confirmed that Mr. Desmond made two payments to him as follows: in 1994, a payment of £100,000 and in 1996, a further payment of £25,000, each payment in Sterling. Mr. Haughey didn’t know whether the payments from Mr. Desmond were loans or donations. He was reminded that Mr. Desmond refers to them as being loans with no strings attached; that is with no provision for repayment and no provision for interest. As far as Mr. Haughey was concerned, these were just monies made available to him. When he was queried as to whether it was his understanding that these monies never had to be paid back, his response was that this was not necessarily so. Queried as to what would have triggered a repayment, his response was he wouldn’t have thought all that much about it. The exact nature of the payments, whether as donations, presents, gifts or borrowings, wouldn’t have been particularly important in his mind at the time he received the money. Mr. Haughey was then queried as to his dealings with Mr. Jack Stakelum. Mr. Stakelum had been responsible for the bill-paying service from 1991. He was involved in the transmission of Mr. Dermot Desmond’s payment of sterling £100,000 to Mr. Haughey in 1994. The routing of the money appeared to be covert. It came from a Swiss bank account through London, into a Cayman account and ultimately into a Cayman or Ansbacher account in Dublin. The actual reception of the payment in Dublin was recorded in a designated account as being for the benefit of Mr. Haughey. This designation was noted by Mr. Stakelum. Mr. Desmond gave evidence about the covert routing of this money and he responded that there was no need for it to be covert, but that he was operating on the instructions given to him by Mr. Stakelum. Mr. Haughey was anxious to point out that those instructions were not given by him and that they were not part of his advice to or instructions to Mr. Stakelum. He stated that he wouldn’t know anything about these transactions or the way that Mr. Stakelum would handle them. Mr. Haughey’s evidence was that the transactions in Switzerland and elsewhere would not have been known to him. Mr. Haughey stated that he had no reason whatsoever to obscure the payment. When this information was brought to the attention of Mr. Stakelum, he informed the Tribunal that he had received a telephone call from Mr. Haughey requesting that he contact Mr. Dermot Desmond who was to make a payment for the purpose of the bill-paying service. As far as Mr. Stakelum was concerned, the service was a confidential one and as he understood the position, the payment from Mr. Desmond was to be treated with the same confidentiality. He had to contact Mr. Padraig Collery to obtain account details which he then advised to Mr. Desmond so that he could make the payment to that account. It will be recalled that it was from Mr. Collery that Mr. Stakelum obtained information concerning the status of the various accounts from which the bill-paying service was funded. Mr. Haughey informed the Tribunal that after Mr. Des Traynor’s death, Mr. Stakelum kept him informed as to the state of his finances. According to Mr. Haughey, Mr. Stakelum usually informed him that his finances weren’t in great shape. Mr. Haughey has also informed the Tribunal that just as he had no reason to obscure the sources of funds, for example, in the case of Mr. Dermot Desmond’s payment, and while he has no recollection of whether he informed his accountants, he feels sure that Mr. Stakelum was in touch with his accountants, Deloitte & Touche. He stated that Mr. Stakelum had a responsibility to make sure that his tax affairs were in order and that it was the business of Messrs. Deloitte & Touche, one of the best firm accountants in Dublin, to put his affairs in order. Mr. Stakelum has informed the Tribunal that he did not inform Mr. Haughey that his finances were not in a healthy state and states that he had no knowledge whatsoever as to the state of Mr. Haughey’s finances; that he was not his financial adviser and that his only function was to perform the bill-paying service; that he had no advisory function whatsoever in relation to Mr. Haughey. He has stated that he was never in contact with Deloitte & Touche about Mr. Haughey’s tax affairs apart from issuing cheques as requested by them to make provisions for payments to the Revenue Commissioners. He stated that he had no function whatsoever in relation to Mr. Haughey’s tax affairs and that he was never asked to become involved in any way whatsoever; that he had no responsibility, not to mention any function, in relation to those affairs and that he was in any case fully aware that Mr. Haughey had his own accountants to deal with those matters. Mr. Haughey has stated that he was happy that Deloitte & Touche and Mr. Traynor, and subsequently Mr. Stakelum, were dealing with his tax affairs. He has stated that he has never consciously or deliberately tried to avoid paying tax; that as far as he was concerned, tax forms would be brought to him and he would sign them. He stated that he was a normal compliant taxpayer and he assumed that, at all stages, his trusted advisers were looking after his taxation situation. This, of course, is a matter which has been taken up obviously with Mr. Haughey’s accountants and tax agents and they, in due course, Sir, will give evidence in relation to these matters, they not having been afforded an opportunity to put any questions themselves, or through the Tribunal, to Mr. Haughey in the course of his examination on commission. Mr. Haughey stated in relation to Ansbacher Cayman and John Furze, that he only knew John Furze as a friend of the late Mr. Desmond Traynor and that he didn’t know where Grand Cayman was until he heard about it in the context of the Tribunal and that he never had any dealings with the Cayman Islands. Evidence was given to the Tribunal that from 1991 to 1992 Irish Intercontinental Bank provided cheques payable to BEL Secretarial Services, that is to say, the bill-paying services operated by Mr. Jack Stakelum, and that these cheques were from February 1991 to September 1992, funded by debits from the Ansbacher accounts and from 1992 onwards, by debits from the subset of Ansbacher accounts, known as the Hamilton Ross account. Mr. Haughey stated that he didn’t know that at the time but that, in light of the Tribunal’s investigations, he was not disputing the point. He did indicate that he had retained the services of an accountant, Mr. Peelo, to, as Mr. Haughey put it, assist the Tribunal to go into all these matters and to try to be of any help that he could. Mr. Peelo has not, in fact, been able to provide the Tribunal with any assistance, and the Tribunal at no time received any direct communication from Mr. Peelo in response to various queries raised by the Tribunal with Mr. Haughey. Mr. Haughey has confirmed that Mr. Peelo didn’t really have any more information than the Tribunal had, but Mr. Haughey points out that with his experience, he might have been able to point out things to the Tribunal on the basis of the information that the Tribunal had supplied to Mr. Haughey. Turning now to a cheque in the sum of £20,000 cash from Mr. Ben Dunne; Mr. Haughey was referred to the evidence of Mr. Ben Dunne, that he paid a visit to Abbeville in 1993. His evidence stated that he was hospitalised at the time and that for a break from the hospital routine, he took a trip out to Malahide. The Haugheys were at lunch and in the course of his visit, he probably gave Mr. Haughey a cheque payable to cash in the sum of £20,000. This cheque was eventually lodged to an account of Mr. Haughey’s in National Irish Bank, Malahide branch. Mr. Haughey responded that he definitely had no memory of getting the cheque. Mr. Haughey was queried in relation to the cheques which had become known as the “bearer” cheques, that is, a number of cheques amounting in the aggregate to £32,000-odd and lodged to an account of Amiens in 1987 in periods shortly before the 1987 General Election. Mr. Haughey indicated that he could not remember any such payments or cheques. In relation to the payment which has become known in the course of the Tribunal’s reference as the Wytrex payment in the sum of STG £200,000, Mr. Haughey indicated that he had never heard of it until the Tribunal’s proceedings. Mr. Haughey again indicated that he knew nothing about the payments known as the Carlisle payments, namely payments from Mr. Ben Dunne in the sum of £180,000 routed through a company, Carlisle, controlled by Mr. John Byrne. In relation to his overall financial affairs, Mr. Haughey indicated to the Tribunal that he left the management of these matters to others, principally to Mr. Des Traynor. He indicated that that being the situation, he could not see how he could be accused of not knowing anything about his affairs inasmuch as since they were handled by others on his behalf, he could not accept knowledge of them in that regard. In relation to raising funds in a general way, he indicated that, while Mr. Traynor may have been entitled to borrow money on his behalf and to hand it over to Mr. Stakelum or to someone else for his benefit, he did not think that Mr. Traynor would have been entitled, as he had no power of attorney, to commit Mr. Haughey to any legal liability. He would not, in other words, have been able to bind Mr. Haughey to become legally liable to repay a loan. Mr. Haughey, in the course of his examination, gave evidence of his dealings with the Agricultural Credit Corporation in connection with stocking loans he had with the company from time to time. His evidence was that he repaid the loans from year to year and that ultimately they were cleared off by way of funds provided by Mr. Traynor. He had already been queried at the public sittings concerning documentation which appeared to be related to a loan raised in the Cayman Islands. This documentation contained Mr. and Mrs. Haughey’s name and their signatures but it will be recalled that he indicated that he knew nothing about the raising of the loan in the Cayman Islands. Where the ACC loan was concerned, his attention was drawn to the fact this his account documentation in the bank was filed on a coded basis and this was only known to a limited number of staff members. This, Mr. Haughey felt, was normal in the course of a person in his position. When it was drawn to his attention that he appeared to have received favourable treatment in that the loan was not subjected to the requirement applicable to all stocking loans with the ACC of a registered chattel mortgage, Mr. Haughey did not believe that this constituted anything of significance. Mr. Haughey, in the course of his examination, stated that he never knew of Mr. Dermot Desmond’s involvement in Feltrim Mining, a company in which his son was in effect a founding member and/or promoter of. Mr. Haughey was referred to the evidence concerning account held by NCB for a company known as Overseas Nominees which was opened on the 7th June 1988 from which, when it was closed, a closing balance of sterling £168,036.81 was transferred to Guinness & Mahon and ultimately credited to an Ansbacher account which appeared to have been used for the benefit of Mr. Haughey. Mr. Haughey indicated that he was not aware of the account and that therefore he had no knowledge as to the source of the money used to purchase investment in NCB. That, Sir, is a brief outline of the matters dealt with in the examination on commission of Mr. Charles Haughey. The Tribunal will continue with an Opening Statement relating to material relevant to the Terms of Reference relating to Mr. Michael Lowry later today and then, in due course, the next step will be that the Registrar will read into the record of the Tribunal the transcripts of the depositions of Mr. Haughey. CHAIRMAN: Mr. Coughlan, it occurs to me that, I understand the two lady typists attached to the Tribunal who have been under considerable pressure in recent days, are in the course of typing the final couple of pages of the remainder of the opening address and it occurred to me that to utilise the time available to us, it might make more sense that Mr. Lehane, the Registrar, were to read the opening day of the 20 days of Mr. Haughey’s examination which is a little more than an introduction to the matters that were summarised by you this morning. MR. COUGHLAN: That’s correct, Sir. CHAIRMAN: Perhaps, for the guidance of those in attendance, I might clarify that much of the content of that initial day was spent by my indicating the procedures which were to be applicable on the occasion of the sworn commission involving the swearing of Mr. Haughey, of myself as Commissioner and of the stenographer and other preliminary matters. So I think it makes sense if we now invite Mr. Lehane to take up the remaining substance of the examination on that first day. CHAIRMAN: I think we should leave it there probably, Mr. Coughlan, and I take it then that the remainder of the opening will be advanced as soon as it’s humanly possible. MR. COUGHLAN: I’d like to apologise, Sir, both to you and to the members of the public. We have run into some slight technical difficulties at the moment and I am just still waiting for one or two final pages to come up, but I am in a position to begin in relation to the continuing of the Opening Statement. This section of the Tribunal’s public sittings will be concerned with Terms of Reference (e), (f), and (g) relating to Mr. Michael Lowry and also to some extent with Term of Reference (k). Term of Reference (e) dealing with substantial payments made to Mr. Michael Lowry in circumstances giving rise to a reasonable inference that the motive for making the payment was connected with any public office held by him or had the potential to influence the discharge of such office. Term of Reference (f) deals with the source of money held in certain bank accounts discovered by the Tribunal to be for the benefit or in the name of Mr. Michael Lowry. In the course of these sittings, the Tribunal will be examining the transaction which initially took the form of a payment of $50,000 US from Telenor, then a Norwegian State Communication Company associated with ESAT Digifone to the late Mr. David Austin for onward transmission to the Fine Gael Party. At the time, Mr. Michael Lowry was Chairman of the trustees of the Fine Gael Party. The trustees owned the assets of the party. The assets include all the funds in the party’s account. Of course, these assets were to be held for the benefit of the party. The Tribunal will be examining all of the circumstances in which this payment was made with a view to ascertaining if it constituted a payment within the meaning of Terms of Reference (e), or a source of money within the ambit of Term of Reference (f). The Tribunal will also be examining a transaction which occurred in October 1996 involving the late Mr. David Austin and Mr. Michael Lowry. The Tribunal has learned that Mr. Austin paid the sum of £147,000 into an account in the name of Mr. Michael Lowry in the Isle of Man. The account was held in an offshore bank, Irish nationwide, Isle of Man Limited, a wholly owned subsidiary of the building society operating in the state, Irish Nationwide Building Society. The Tribunal will be examining this transaction in order to ascertain once again whether it comes within the ambit of Term of Reference (e) and (f). The Tribunal has been informed that the money used by Mr. David Austin to fund the payment to Mr. Michael Lowry’s account represented the proceeds of the sale of a property he owned in Spain. Mr. Denis O’Brien has informed the Tribunal that he purchased a property in Spain from the late Mr. David Austin. The Tribunal will also be examining a number of relationships involving certain property transactions in England in which Mr. Michael Lowry was involved. These transactions appear to have occurred since 1998. The first of these transactions concerned the purchase of and potential development of a property at Mansfield in the English midlands. It appears that the transaction involved a joint venture between Mr. Lowry and Mr. Aidan Phelan. Mr. Aidan Phelan was an associate of Mr. Denis O’Brien. The joint venture involved a payment on Mr. Phelan’s side of £300,000 sterling and on Mr. Lowry’s side, a payment of £25,000 sterling. The £300,000 sterling appears to have been sourced from an account of Mr. Denis O’Brien with Credit Swisse First Boston in London. While I intend to deal with the details of these transactions, it is only fair to say at this point that Mr. O’Brien has stated that he knows nothing of them. At the same time, the Tribunal wish to examine the circumstances of the payment and the circumstances surrounding the transaction in the context of Term of Reference (e) and (f). It should be noted at this point, Mr. Lowry was a TD having ceased to be a minister. The second property transaction involved a property in Cheadle also in the UK, in the Manchester area. The funds for this transaction came from a number of different sources. The deposit was provided by Mr. Phelan out of a balance which remained out of the £300,000 sterling I have mentioned already. The balance of the funds were provided by way of a loan from GE Capital Woodchester, now known as Investec, a bank which operates within the state mainly as far as the Tribunal can see, in Dublin, and which appears to have had close associations with Mr. Phelan and Mr. Denis O’Brien, that is Mr. Aidan Phelan. From the information provided to the Tribunal by the bank, it would appear that the bank were informed that the transaction was being sponsored by Mr. Denis O’Brien. At the time of the Mansfield and Cheadle transactions, Mr. Michael Lowry had ceased to be a minister but continued to hold office as a TD. The Tribunal, having already touched on this issue in the context of the evidence given concerning Mr. Denis Foley TD and Mr. John Ellis TD, while it doesn’t seem to be necessary to go into the matter in any detail, it should be clear from what was stated in connection with the interpretation of the Terms of Reference in the context of evidence connected with Mr. Foley and Mr. Ellis, that the expression “public office” use in Term of Reference (e) embraces the office of a member of the Dail and it is not confined to the holder of ministerial office. At this point, the focus of the Tribunal’s sittings with regard to these matters will be on what is commonly described as the money trail. The information made available to the Tribunal will, however, involve examining material concerning relationships, connections or dealings between Mr. Lowry and a number of individuals against a background in which some of these individuals and Mr. Lowry were involved in a competition to operate what has come to be known as the second GSM licence. While this may be part of the background and may ultimately require to be examined in the context of Term of Reference (g), it would be wrong at this stage to draw any conclusions or to speculate as to what finding might be appropriate in the context of evidence concerned primarily with the money trail. Term of Reference (k) will become relevant in the context of what is described as the Telenor payment. The $50,000 US I intend to describe as the Telenor/Esat payment. The £147,000 payment I propose to describe as the Carysfort Avenue/David Austin payment. I intend to refer to the two English property transactions as the Mansfield transaction and the Cheadle transaction. These four matters came to the notice of the Tribunal in different ways. The Telenor/Esat $50,000 US payment came to the notice of the Tribunal as a result of public controversy, the matter having been first mentioned in the media. The next matter to come to the notice of the Tribunal was the Cheadle transaction. This was brought to the Tribunal’s attention by Investec as a result of internal inquiries carried out by the bank. It was the bank’s own concerns which prompted it to bring the matter to the attention of the Tribunal and as it happens also, to the attention of the Central Bank. The bank brought the Cheadle transaction to the attention of the Central Bank and to the Tribunal. The Tribunal brought that transaction to the attention of Mr. Lowry as well as some other persons. When that transaction was brought to the attention of Mr. Lowry, he then revealed to the Tribunal the Carysfort Avenue/David Austin transaction. When the Cheadle transaction was brought to the notice of Mr. Aidan Phelan, it was Mr. Aidan Phelan who brought the other English transaction i.e., the Mansfield transaction, to the Tribunal’s attention. Because it would appear that many of these transactions, all of which would seem on a prima facie basis to be connected with the Tribunal’s queries, that some attention will be paid to the circumstances in which the transactions and information concerning them appears to have been obscured for a number of years. At this stage, however, I propose to endeavour to set out the information currently available to the Tribunal in something approximating to historical or chronological order beginning with the Telenor payment. This payment was made in 1995. In that year Mr. Michael Lowry was a government minister. One of his major tasks, and indeed one of the milestones of his ministerial career was the setting up of the competition to grant what has come to be known as the second GSM licence. The competition was in full swing in the latter part of that year. At that time, Mr. Michael Lowry was also Chairman of the Trustees of the Fine Gael Party. The late Mr. David Austin died in November 1998. As of 1995, he was a close personal friend of Mr. Lowry’s. He was also a supporter of the Fine Gael Party. He had a role as the person responsible for the organising of a major fundraising event in New York. The preparation for the New York event commenced in the middle of the year, although the event wasn’t due to take place until November of 1995. In July of 1995, Mr. Austin wrote to Mr. Michael Lowry concerning the New York fundraising dinner setting out his proposals and enclosing a list of invitees which he felt the Party should target. These invitees all had associations with American or with Irish/American business life. The fundraising event was organised, as is usual in these cases, by deputing individual members of a fundraising committee or other persons assisting the major fundraiser with responsibility for targeting selected proposed invitees. Michael Lowry was given a number of proposed invitees to follow-up. The list did not include any reference to Esat, Telenor, or Mr. Denis O’Brien or any other person as far as the Tribunal can judge, associated with the contest. And when I use the word “contest” in that regard, I mean those associated with Esat, Telenor or Denis O’Brien in any business or professional context. The fundraising event envisaged a dinner in New York to which the then-Taoiseach, Mr. John Bruton, would be invited. The other invitees were promised a place at the table and were expected to make a contribution, and from the information made available to the Tribunal, it would appear that the minimum contribution was fixed at $7,500 US. In all, some 20 people attended and although it would appear that some of the invitees did not attend, contributions nevertheless appear to have been made even by some of the absentees. Careful accounts were kept of the attendees at the dinner, of the amount promised by them and of the amounts ultimately actually received from them. The total amount raised at the dinner was $167,500 US. From the accounts, it would appear that the maximum contribution recorded was in the order of $15,000. Mr. Denis O’Brien has informed the Tribunal that Mr. David Austin telephoned him about the event and that they discussed the possibility of Mr. O’Brien attending. Mr. O’Brien did not attend the event. He has informed the Tribunal that he brought the matter to the attention of Mr. Arve Johannson of Telenor invest, effectively his main partner in the Esat bid, which by that stage of course, had been successful. The decision to grant the licence to the Esat consortium had, in fact, been made on the 23rd October, 1995. Mr. Johannson has informed the Tribunal that the first time this matter was brought to his attention was at a meeting with Mr. O’Brien in Oslo on the 8th December 1995, that is after the dinner had, in fact, taken place. According to Mr. Johannson, Mr. O’Brien wanted to make a donation of $50,000 US to Fine Gael but did not wish to make the payment through Esat or directly, that is, on his own behalf as this might give rise to adverse comment in the media. Mr. Johannson’s impression that was Mr. O’Brien was already committed to making the payment. He has also informed the Tribunal that as Esat had not been capitalised Mr. O’Brien asked Telenor to make the payment and agreed that Esat would reimburse Telenor in full. Mr. O’Brien has informed the Tribunal that he agrees that a meeting took place, but he has not provided the Tribunal with any details of what transpired at the meeting. According to Mr. Johannson, he received a telephone call from Mr. O’Brien on or about the 11th December 1995. He received a telephone number for Mr. Austin from Mr. O’Brien. Mr. O’Brien agrees he telephoned Mr. Johannson but states that he gave Mr. Johannson Mr. Austin’s UK number and while Mr. Johannson asserts that he was given Mr. Austin’s Dublin number at the Smurfit headquarters in Clonskeagh, it would appear that on the same day Mr. Johannson telephoned Mr. Austin in Dublin; that Mr. Austin was expecting a call and that he already knew the amount of donation and that this had been agreed with Mr. O’Brien. Mr. Johannson mentioned that Telenor would need some piece of paper in order to make the payment and Mr. Austin suggested he would issue an invoice for consultancy work. Of course, Mr. Austin, had not performed any consultancy services for Telenor. “Dear Mr. Johannson, please find invoice for consultancy work for the duration of 1995 as agreed with Mr. Denis O’Brien. I hope that you will find this in order. The invoice was for $50,000 US in respect of consultancy work for 1995. There was an instruction on the invoice that the payment should be made to the account of David F T Austin, account number 66064, Bank of Ireland Jersey, the address of the bank was given. If you go to the top, again that states at the very top, “Invoice for consultancy work for 1995 as per agreement.” The date is the 14th December 1995. It’s addressed to Mr. Johannson. His telephone number is given. The amount is given and there is a conversion rate then which takes place in Norwegian kronar which was, according to Mr. Johannson, put on by a member of the staff at Telenor. An indication then was given of who the bank draft is to be made payable, the account number and the address of the bank at the bottom. Now, in the very bottom corner, there is what appears to be a computer file reference, David F T Austin/Fine Gael/December ’95”. This was the first time that Mr. Johannson was aware that the payment was to be made into an offshore bank. The $50,000 US was then transferred by Telenor through their Norwegian bankers. On the 3rd January 1996, Telenor issued an invoice to Esat for 316,000 kronar. This invoice referred to consultant David F T Austin, it’s addressed to ESAT Digiphone, the amount is given as 316,000 kronar. And the date of the invoice is the 3rd January, 1996. The invoice referred to consultant David F T Austin as I said. On the 31st December 1995, a new invoice was issued omitting any reference to the name David Austin. This new invoice omits any reference to the name of David Austin. This was again issued for $50,000 US. The invoice referred to consultancy fee, Telenor Invest AS. It appears that this second invoice was also unacceptable to ESAT who insisted that a credit note be issued and requested a further invoice in Irish pounds. A credit note was issued on the 24th January of 1996. ESAT requested that this Irish-pound invoice should not be issued until after four to six weeks later. It was, in fact, issued on the 27th March 1996. The invoice was charged to the running account between Telenor and ESAT and was discharged by ESAT by way of a payment made on the 30th June, 1996. Now, if I could just go back to the invoice which was finally issued and finally accepted by ESAT Digiphone and it’s for consultancy fee for Telenor Invest AS and the price was £31,300 Irish. Now, when this particular invoice was discharged by ESAT by way of a payment made on the 30th June, 1996, it was not an individual item dealt with in dealing with the account, the account between Telenor and ESAT, but was part of a much larger number of transactions. In the meantime, on the 19th February 1996, Mr. David Austin wrote to Mr. Johannson acknowledging the payment. The letter is as follows — it’s from David Austin, 109 Flood Street, Chelsea, SW3, 5TD, England, 19th February 1996. Mr. Harvey Johannson, Telenor International in Norway. . “Dear Mr. Johannson, my sincere thanks for the payment of the invoice in relation to consultancy carried out for 1995. Please forgive the total oversight on my part in not acknowledging receipt of payment and indeed passing on my thanks. “This was certainly not something that was taken lightly on my part and not on those from who have received payment. Please be assured of their appreciation and thanks. “Once again, my sincere apologies for my tardiness. 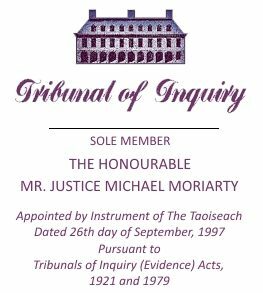 Nothing may turn on this, and it may be that a poor copy has been furnished to the Tribunal, but this particular acknowledgment does not appear to contain the computer file reference to Fine Gael on it. And neither did the previous letter. It would appear that Mr. Austin was in contact with Mr. John Bruton, then-Taoiseach and leader of Fine Gael, in late February of 1996. Mr. Bruton has informed the Tribunal that David Austin told him that there was money available from ESAT Digiphone interests for Fine Gael. Mr. Bruton made it clear in response to Mr. Austin his overriding concern that a donation would not be made to Fine Gael from ESAT at that time. He felt that Fine Gael should not accept money from that quarter so soon after the decision to grant the second mobile phone licence had occurred. He has informed the Tribunal that at the same time, Mr. Austin was very keen that Fine Gael should accept the donation and pressed Mr. Bruton to do so. Mr. Bruton believes that there must have been some mention of money being in a bank account and that Mr. Austin may have said something to the effect that it is there for you in a bank account. While Mr. Bruton did not focus on these details, he has informed the Tribunal that he believed the money to be still under the control of the donors and not under Mr. Austin’s control and it is in this context that he then responded to Mr. Austin using an expression “Leave it where it is.” He was anxious to convey to Mr. Austin, without causing offence either to the donor or to Mr. Austin, that he believed Fine Gael could not accept the donation at that time but did not wish to rule out any donation for all time from the donor once it was no longer opened to be misconstrued. Mr. Bruton has informed the Tribunal that he did not authorise Mr. Austin to accept any money on behalf of Fine Gael. Of course, as I have already mentioned, it would appear that by this time, Mr. Austin had, in fact, already sent a letter of acknowledgment to Telenor. Nothing further of significance appears to have occurred in connection with this money until late April or early May of 1997. In the meantime, it would appear that the money remained in an account in the Channel Islands in the name of Mr. David Austin. Sometime in or around late April/early May of 1997, Mr. Austin telephoned Mr. Jim Miley, who was then the General Secretary of Fine Gael, indicating that he wished to make a personal contribution to the party. At that time, Mr. Frank Conroy was a member of Capital branch of the Fine Gael Party and had an involvement in fundraising of both Mr. Austin and Mr. Michael Lowry. He has informed the Tribunal that Mr. Austin telephoned him around the same time as he had contacted Mr. Miley, informing him that he was sending on monies for further transmission to Fine Gael. On receipt of the money, Mr. Conroy thinks that he either posted it or more probably delivered it by hand to Mr. Miley for the Party’s General Secretary. When Mr. Miley received the money, he treated it as the personal donation Mr. Austin had spoken about to him on the phone. It is significant that Mr. Austin had never made a substantial contribution to Fine Gael funds so far as records show prior to that date. It would appear from the records seen by the Tribunal to date, in any event, that his most recent contributions were in the order of hundreds of pounds rather than thousands of pounds. This matter seems to have formed the subject of discussions within ESAT Digiphone in or about the 4th November 1997. At that time, ESAT was preparing for the issue of a prospectus for the initial public offer of shares in ESAT Telecom which has come to be known as the flotation of ESAT. The Tribunal has not been able to obtain a complete picture of what transpired at this meeting or at related meetings in view of the fact that Telenor have claimed legal professional privilege in relation to what transpired at the meeting. It would appear that the meeting was held to discuss concerns relating to the issue of the prospectus. It was held at the offices of IIU, a company owned by Mr. Dermot Desmond in Irish Financial Services Centre. This was a meeting of the representatives of the major shareholders in ESAT, namely, ESAT, IIU, Telenor, and interests of Mr. Denis O’Brien. A number of issues were discussed at the meeting including the Fine Gael donation. According to Mr. Johannson, it was agreed to seek from Mr. David Austin written confirmation that the donation had, in fact, been paid to the Fine Gael Party and that it had not been paid to any other person. According to Mr. Johannson, Messrs. William Fry Solicitors offered to contact Mr. Austin to obtain the required letter. Messrs. William Fry have informed the Tribunal that they know nothing of this matter. It would appear, however, that a written confirmation was obtained from the late Mr. Austin who was, at that time, resident in France and suffering from a serious illness from which he ultimately died a year later. Mr. Austin provided a note confirming that this was a payment from Telenor to Fine Gael. This Tribunal was not contacted by any of the parties involved in the preparation of this prospectus or the issue of it to ascertain the view of the Tribunal as to its view of its own Terms of Reference and nor was the Tribunal aware that this particular interpretation was being offered as part of the prospectus. It would appear that by the 9th February 1998, Telenor still had concerns regarding this payment and in particular, whether it should be notified to this Tribunal. Telenor decided to contact the Fine Gael Party directly. Telenor has informed the Tribunal that before contacting the Fine Gael Party, it notified its intention to its fellow ESAT shareholders, namely, Mr. Denis O’Brien and Mr. Dermot Desmond. A meeting took place on the 13th February, 1998, in which Mr. Fintan Drury of Drury Communications, together with a solicitor, both representing Telenor, informed Mr. Jim Miley, the then-secretary of Fine Gael, and Mr. Kevin O’Higgins, solicitor, of the information they had concerning the payment. Mr. Miley has informed the Tribunal that he contacted Mr. David Austin by telephone and that Mr. Austin confirmed that he had approached Mr. O’Brien to request a contribution for Fine Gael in the context of the New York dinner in November 1995; that Mr. O’Brien had indicated to him that he wished to have a donation paid via Telenor in order to ensure confidentiality; that Mr. Austin made the arrangements with Telenor to have the money paid to him, and that the money was held by him until May 1997, when he passed it on to Fine Gael in the guise of a personal contribution. In the course of that conversation, Mr. Austin also remembered and informed Mr. Miley that he had mentioned the donation to Mr. Bruton who had expressed misgivings about it. Mr. Austin informed Mr. Miley that Mr. Bruton would never have known that the payment had, in fact, been made. Mr. Miley has informed the Tribunal that in the course of the telephone conversation, that Mr. Austin was emphatic, that he had no discussions with Mr. Michael Lowry on the matter and that Mr. Michael Lowry had nothing whatsoever to do with the payment. As a result of the meeting, a letter was written by solicitors for Fine Gael to solicitors for Telenor confirming that at the time when the Telenor contribution was paid over to the party, “Mr. Lowry was not a named account holder at that time and had no authority or signing capacity in relation to the same.” Telenor were anxious to establish this particular circumstance, the circumstance being the date at which the contribution was paid over to the Fine Gael Party and Mr. Lowry’s capacity or role in the party at the time the money was actually paid over by Mr. Austin to the Fine Gael Party. Telenor subsequently took up the matter once again with Fine Gael seeking to establish the date at which the payment was received by them. A further letter from Fine Gael solicitors confirmed that at the time when Telenor’s contribution was paid over to the party, that is in May of 1997, Mr. Lowry was not a named account holder at that time and he had neither authority or signing capacity in relation to the account. It does not appear that either Fine Gael or Telenor pursued the question of the status of the payment or Mr. Lowry’s role in the party as of 1995, when the money was paid by Telenor. It would appear that at that stage, Fine Gael decided there was little point in endeavouring to return the cheque to anyone. The matter came into the public domain at the beginning of March of this year. Subsequently, Fine Gael’s new General Secretary, Mr. Tom Curran, made a further effort to return the money to Telenor. A draft was sent to their solicitors, who then confirmed that they were arranging to forward it to ESAT Digiphone. Since then, the draft has apparently passed from one to the other person involved in the issue. Mr. Denis O’Brien has stated that the payment was in the nature of a legitimate political contribution or political payment; that it was so regarded in the pre-prospectus discussion, that is at the meeting of the 4th November, 1997, to which I have already referred. That, of course, was the meeting which proceeded the written confirmation from the late Mr. David Austin. In a letter to the tribunal, Mr. Michael Lowry has asserted that he knew nothing of the payment, that he knew nothing of the manner in which it was made or of the involvement of the late Mr. Austin. More specifically, he has stated to the Tribunal that Mr. David Austin was well-known to him, having been a long-term supporter of Fine Gael, that he, Mr. Lowry, had no dealings or involvement with Mr. Austin. He went on to say that he and Mr. Austin would have come in contact with each other at social functions and at various functions organised by Fine Gael. At the time this letter was received by the Tribunal, the Tribunal had not become aware of Mr. Lowry’s dealings with Mr. David Austin. Those matters were brought to the attention of the Tribunal by Mr. Lowry himself, but only after the Tribunal had sought his comments on information made available to the Tribunal concerning his dealings with the bank, now known as Investec, GE Capital, Woodchester in connection with property transactions in England. Evidence has already been given to the Tribunal concerning the purchase by Mr. Lowry of a property at 43 Carysfort Avenue, Blackrock, County Dublin, on the 17th July 1996. This property was, in fact, purchased by Mr. Donal Gahan, solicitor, in trust for Mr. Lowry. The property had been identified by Mr. Michael Holly, an associate of Mr. Michael Lowry. Mr. Lowry also gave evidence that the purchase of the property was financed by 100% borrowing. Since that evidence was given, the Tribunal has now learned that, in fact, the property was in a poor state of repair and required substantial monies to make it habitable involving a figure upwards of £90,000. Mr. Lowry approached Mr. Michael Fingleton of Irish Nationwide Building Society to obtain finance for the purchase. He left Mr. Fingleton with the impression that as a hundred percent finance was being sought, he was proposing to use his own resources to carry out a refurbishment or repair of the property. At the time of the acquisition, Mr. Fingleton was under the impression that Mr. Lowry intended to avail of what is known as the Dual-Abode allowance available to Government Ministers and Junior Ministers. This Dual-Abode allowance is available under a scheme operated by the Revenue Commissioners whereby Government Ministers and Junior Ministers representing constituencies outside Dublin become entitled to substantial Income Tax allowance in respect of the purchase, the refurbishment, the repair and the maintenance of a property in Dublin. In fact, under the scheme, a minister may elect to rely on the allowance in respect of a property acquired (or obtained on lease) in Dublin or his home residence outside of Dublin. In any case, the allowances are very substantial and would certainly be sufficient to enable a minister to take on the sizable borrowing obligations involved in acquiring, repairing, and maintaining a second home. Mr. Fingleton was not made aware of the details of the resources from which Mr. Lowry intended to fund the refurnishingment work. It now appears that the refurbishment was to be made with monies available to Mr. Lowry in an offshore account in the Isle of Man. It seems that sometime in October of 1996 and prior to the public controversy which ultimately led to his resignation, Mr. Lowry opened an account with the Irish Nationwide (Isle of Man) Limited, a financial institution controlled by Irish Nationwide and operating in the Isle of Man jurisdiction. It now appears that at some date on or prior to the 18th October 1986, a sum of £147,000 was lodged to that account. The lodgment consisted of a bank draft drawn on the Bank of Ireland, Jersey. The bank draft was payable to Mr. David Austin and seems to have been purchased by him with funds debited to his sterling account in the same bank in the Channel Islands. On the overhead projector we have the draft made payable to Mr. Austin. It’s for the sum of £147,000 Irish. It’s funded from his own account. This particular account of Mr. Austin’s appears to have been opened sometime in late July of 1996, and the opening lodgements consisted of the sums of £100,000 and £50,000, which the Tribunal has been informed represents the proceeds of the sale of a property which Mr. Austin had in Spain. This property, which Mr. Austin sold, was purchased by Mr. Denis O’Brien and this sum of £150,000 represents the proceeds of that sale. The Tribunal has not yet succeeded in obtaining the documentation concerning the sale transaction. The Tribunal, of course, will wish to examine the circumstances in which Mr. Lowry’s account in the Isle of Man was opened and into which the payment of £147,000 was lodged and in particular, the fact that the existence of this account and that the lodgment to the account made by way of a bank draft by Mr. David Austin was not revealed to the Tribunal until April of this year; further, in view of the fact that at that time, Mr. Lowry appears to have had other resources available to him from which he could have funded the refurbishment of the house at Carysfort Avenue; another feature of the arrangement is that it would now appear that Mr. Michael Holly had tendered to carry out the refurbishment at Carysfort Avenue at a cost in or around £90,000 inclusive of VAT. At the time of the opening of the account, Mr. Lowry completed account-opening documentation in his own name. He gave as his address the offices of a firm of accountants, Brophy Butler Thornton, at the Gables, Foxrock, County Dublin. In filling out the form, he also made it clear that there was to be no correspondence except on request. The Tribunal has been in touch with Messrs. Brophy Butler Thornton, who have informed the Tribunal that they were completely unaware and gave no consent to the use of their address for this purpose. At the time Messrs. Brophy Butler Thornton had certain associations with Mr. Lowry in a professional capacity. They were not his tax agents. Indeed as appeared from other evidence given to the Tribunal at its last sittings, Mr. Lowry, at that time, was dealing with two other firms of accountants in connection with his tax affairs, both of whom appear to have had made contact with the Revenue Commissioners in connection with those affairs at or about the time that his dealing with Mr. Ben Dunne became a matter of public controversy in November of 1996. Messrs. Brophy Butler Thornton have also informed the Tribunal that they were never made aware by Mr. Lowry that he either intended to or that he had opened such an account; and that the account was only brought to their attention by Mr. Lowry in April of this year prior to the information being made available to the Tribunal. A further circumstance concerning the opening of this account is that on the account-opening documentation, Mr. Lowry described himself as a company director. At that time, he was, of course, a government minister and had, according to the register of members interest, ceased to be a director of Garuda. Now, just on the overhead projector the account opening form for Irish Nationwide (IOM) Ltd. It’s for an application for a fixed rate account. The name is given as “Michael A Lowry (private and confidential)”; the address is “Brophy Thornton, the Gables, Foxrock, County Dublin”; registered address “as above”; correspondence address “as above”; daytime telephone number et cetera. Then there is a note: “No correspondence except on request.” Nationality, Irish. Occupation, company director. The Tribunal has endeavoured to obtain the cooperation of Irish Nationwide (Isle of Man) and has sought the assistance of its parent company, Irish Nationwide Building Society in Dublin. It has, in addition, provided Irish Nationwide Isle of Man with a waiver from Mr. Lowry whereby the Isle of Man institution would be at liberty to provide the Tribunal with any documents and any other information otherwise than a documentary form including access to its officials to deal with this matter. The Tribunal has not, however, succeeded in persuading the officials of the bank, that is the Isle of Man company, to come to Dublin to give evidence, and as of this moment, the Tribunal has been informed by Irish Nationwide (Isle of Man), that the officials will not be made available to the Tribunal to give evidence in Dublin or to assist the Tribunal with information. It will be borne in mind that as an offshore entity, they cannot be compelled under process of law to appear as witnesses. A, that he owed Mr. David Austin the sum of £147,000. B, that this sum would be repaid on the 18th October 2001 or on the sale of the property at 43 Carysfort Avenue, whichever would be earlier. C, that in the meantime, interest would accrue at the lending rates applied by the Irish Permanent Building Society. D, that the interest would be payable on the date of the repayment of the loan. The manuscript acknowledgment was signed by Mr. Lowry and was dated the 24th October, 1996. The date is also in Mr. Lowry’s handwriting. The rest of the manuscript appears to be in the hand of Mr. David Austin. Mr. Lowry has informed the Tribunal that as he had decided not to reside in the property at Carysfort, he agreed to sell it to Mr. Michael Holly who had assisted him in the purchase of it at what, as he put it, effectively the cost price plus expenses. It would appear that this transaction, that is the sale to Mr. Holly, took place sometime in July, 1997. Mr. Lowry has informed the Tribunal that he decided to repay Mr. Austin and that this was done on the 7th February, 1997, the day upon which the McCracken Tribunal was established. The McCracken Tribunal goes on to note the fact that Mr. Lowry had two offshore accounts in his own name, one in the Bank of Ireland in the Isle of Man and the other in an Allied Irish Bank subsidiary in Jersey; in fact, as we now know, he had some short time prior to the making of that statement in Dail Eireann, opened an account in the Irish Nationwide in the Isle of Man, in which, as at the date of the making of the statement, there was a credit balance in excess of £147,000. The concealment of this loan is a factor to be considered by the Tribunal in determining whether this money was in truth a loan or a payment within the Terms of Reference. In March of the year 20001, the Tribunal was contacted by Messrs. McCann Fitzgerald, solicitors, solicitors for a bank called Investec. Investec is a bank which has taken over the banking business of GE Capital Woodchester. The bank approached the Tribunal arising from concerns it had that there were loan transactions on its books which concerned Mr. Denis O’Brien and Mr. Michael Lowry. Those facts in themselves would not have warranted any concerns but for the additional factor that the apparent involvement of Mr. Michael Lowry and Mr. Denis O’Brien in borrowing from the bank had not become clear until after the bank’s own investigations had taken place over the previous weeks. These investigations were initially prompted by ordinary commercial concerns regarding the processing of loan documentation. It was as a result of information made available to the Tribunal by Investec that the Tribunal became aware of a transaction involving what has already been described as the Cheadle property. Having drawn the Investec/Cheadle transaction to the attention of Mr. Aidan Phelan, the Tribunal was informed of another transaction or relationship Mr. Phelan had involving Mr. Lowry relating to a property transaction in Mansfield. As the Mansfield transaction preceded the Cheadle transaction in time, I propose to begin by referring to the outline of that transaction. A Mr. Kevin Phelan is a development property consultant operating in the United Kingdom. He is not a relation of Mr. Aidan Phelan, although they did have a business relationship. Prior to the events to which I will now refer, he did not have any relationship with or apparent contact with Mr. Michael Lowry. The Tribunal has been informed by Mr. Michael Lowry that sometime in late 1997, he was put in contact with Mr. Kevin Phelan through an intermediary. Mr. Kevin Phelan wished to interest him in UK property by way of acquisition and development. Mr. Lowry expressed an interest but it was not until July of 1998 that Mr. Phelan contacted him to inform him that he had located a development site at Mansfield in which he might be interested and that there was a possibility of development. Mr. Michael Lowry has informed the Tribunal that when he inspected the site, he agreed to purchase it for £250,000 sterling subject to a payment of a deposit of 10% which he was then to provide. Mr. Kevin Phelan undertook to seek an investment partner in connection with this transaction. Mr. Kevin Phelan introduced Mr. Michael Lowry to a solicitor in Northampton called Mr. Christopher Vaughan. A deposit of STG £25,000 was forwarded by Mr. Michael Lowry to Mr. Christopher Vaughan. This was in December 1998. By March of 1999, the balance of the purchase price amounting to STG £230,546.42 sterling had to be provided. By the end of March, Mr. Lowry was under considerable pressure to close the deal and through his solicitor, had been in receipt of a completion notice whereby a deadline was fixed for the provision of the balance of the purchase price and the closing of the deal. It does not appear that Mr. Lowry had made any arrangements to find the balance of the purchase price. At that time, it seems that he came into contact with Mr. Aidan Phelan. Mr. Aidan Phelan, had for many years, been a close associate of Mr. Denis O’Brien and had an active involvement in running Mr. O’Brien’s banking arrangements and in particular, Mr. O’Brien’s relationship with GE Capital Woodchester. Mr. Phelan had also had his own relationship with that bank. This will be of greater relevance in the context of the transaction which I have referred to as the Cheadle transaction. To return to the Mansfield transaction, it would appear that Mr. Aidan Phelan agreed to become a partner with Mr. Lowry. Mr. Aidan Phelan had had a previous relationship with Mr. Kevin Phelan and with Mr. Christopher Vaughan, the solicitor who was dealing with the matter. This relationship had directly involved Mr. Denis O’Brien. A sum of £300,000 sterling was provided by Mr. Aidan Phelan from an account in Credit Swisse First Boston in London. This sum was paid into the client account of Mr. Christopher Vaughan to the credit of Mr. Michael Lowry and Mr. Aidan Phelan. Although some STG £300,000 was credited to the account at that time, the actual requirement was for no more than slightly in excess of STG £230,000. The account in Credit Swisse First Boston London, from which the funds were transferred, was, in fact, an account of Mr. Denis O’Brien. Mr. Phelan, that is Mr. Aidan Phelan, has informed the Tribunal that he had the authority of Mr. Denis O’Brien to draw this sum from the account and that it represented an advance on a bonus payment which he was negotiating with Mr. O’Brien in connection with certain services he had rendered to Mr. O’Brien in relation to Mr. O’Brien’s other commercial activities. Mr. O’Brien has said that he had no knowledge whatsoever of the Mansfield transaction until it was brought to his attention by the Tribunal. This property has, at all times, been registered in the sole name of Mr. Michael Lowry. No interest of Mr. Aidan Phelan is registered in connection with the title to the property despite the fact that the solicitors, Messrs. Christopher Vaughan, appear to have recommended the registration of a caution to protect Mr. Phelan’s interest. The Tribunal has been furnished with a joint venture agreement whereby the profits and losses on the transaction are to be shared between Mr. Lowry and Mr. Phelan on a basis of 90% to Mr. Phelan and 10% to Mr. Lowry. This agreement does not appear to have been entered into until some three to four days after the provision of the funds for the completion of the sale. The property has not been sold or it would appear otherwise developed and it is still in Mr. Lowry’s name. Mr. Kevin Phelan was also responsible for bringing the Cheadle property to Mr. Lowry’s attention around April or May of 1999, that is to say just after the completion of the purchase of the Mansfield property. Mr. Lowry has informed the Tribunal that this was to have nothing to do with the joint venture agreement he had with Mr. Aidan Phelan and that it was to be purchased and ultimately turned around on a quick sale for the benefit of Mr. Lowry alone. The deposit on the property in the sum of £44,500 sterling was paid by Mr. Lowry on the 8th September 1999. It would appear that this deposit was funded by the balance of the £300,000 sterling payment out of Mr. Denis O’Brien’s account (on the instructions of Mr. Aidan Phelan) into Mr. Christopher Vaughan’s client account to stand to the credit of Mr. Lowry and Mr. Phelan. The sale of the Cheadle property was due to close on the 30th November 1999. It does not appear from the information made available to the Tribunal that Mr. Lowry took any steps to fund this acquisition. However, by the time the pressure came on to close the sale, Mr. Lowry obtained the funds through the intercession of Mr. Aidan Phelan. Mr. Aidan Phelan has informed the Tribunal that he contacted Mr. Michael Tunny of GE Capital Woodchester and sought sanction for a loan of £420,000 sterling. He indicated to Mr. Tunney that this was a loan to fund a property acquisition in the UK and that the loan was to be made to a company known as Catclause Limited. This was a UK registered company. He also indicated that guarantee would be provided by a Mr. John Daly, a Cork businessman. Through Mr. Tunney, the bank made the money available for the closing of the sale on short notice. It appears that the entire transaction from the banking point of view, was completed within a very short time. As of this moment, the bank and the Tribunal have not been able to obtain the original loan file. From information made available to the Tribunal by Investec bank and from Investec bank’s own investigations, it would seem that the paperwork was not completed prior to the draw-down of the money and that but for the involvement of Mr. Aidan Phelan, the loan would not have received approval. Mr. Aidan Phelan has informed the Tribunal that when he brought this proposal to the bank, he informed the bank that while Catclause was the borrower, Mr. Michael Lowry was the effective owner of the company or the ultimate intended beneficiary of the transaction being funded by the loan. Mr. Tunney, who was the then senior official in the bank, does not agree that he was so informed; and, in fact, has informed the Tribunal that it was his impression that from what Mr. Phelan had told him and from the documents provided to him, Mr. Phelan was to be the beneficiary of the loan. He has informed the Tribunal that Mr. Phelan was a borrower with a longstanding and successful association with the bank. The directors of Catclause were Mr. Michael Lowry and his daughter. It would appear that the property was not actually taken into the name of Catclause but rather into the name of Mr. Christopher Vaughan and his wife who was also a solicitor in Mr. Vaughan’s office, the office acting for Catclause in the transaction. Although the loan proceeds were drawn-down quickly, the bank documentation was not put in place. It appears that ultimately, the guarantee intended to be provided by Mr. John Daly was not forthcoming. Although certain documentation was provided by Mr. Daly whereby he undertook to guarantee the loan, the documentation was not properly executed. When Mr. Daly was requested to reexecute the guarantee documentation, he declined to do so. The loan was due to be repaid on the 31st July 2000. At that point, the bank sought to have the arrangements with Mr. Aidan Phelan and Mr. Christopher Vaughan regularised. Over a course of various dealings, the bank was promised that the property would be sold and that their loan would be discharged out of the sale price. When this did not occur and the bank put in train its own investigations, it became clear to the bank that the property had not, in fact, been taken in the name of Catclause; that, in fact, Catclause had been dissolved and removed from the register of companies in England, that the directors of Catclause were Mr. Michael Lowry and his daughter. The bank had not been aware of any of these matters and when they were drawn to the attention of Mr. Aidan Phelan on the 28th February 2001, Mr. Phelan stated to the bank that from a credit point of view, the bank had nothing to be unduly concerned about as this was a Denis O’Brien transaction and that he would ensure that the bank was looked after and that furthermore, Mr. Aidan Phelan would do everything that was necessary to sort out the unsatisfactory state of the banking documentation. Mr. Aidan Phelan also informed the bank that Mr. Christopher Vaughan had been instructed not to reveal any information in relation to matters concerning Mr. Aidan Phelan or Mr. Denis O’Brien without their instructions. The bank then had a meeting with Mr. Michael Tunney who by that time was no longer an executive of the bank, although he continued to be a director of one of the bank’s associate companies. Mr. Tunney was asked whether he was aware of the identity of the directors of Catclause and he stated that he believed Mr. Aidan Phelan was a director. When some days later Mr. Tunney was informed by Mr. Michael Cullen, a senior official of the bank, that the directors of Catclause were Mr. Michael Lowry and his daughter, Mr. Michael Tunney seemed shocked. In the course of a further telephone conversation between another executive of the bank, that is a UK executive, Mr. Woeman, Mr. Michael Tunney indicated that once again the bank should not worry as Mr. Denis O’Brien was behind the transaction. It was at this time that, having discussed the matter with the Central Bank, Investec brought the information they had obtained in the course of their investigations to the notice of the Tribunal. The loan was ultimately repaid on the 21st March of this year by Mr. Aidan Phelan. Mr. Michael Lowry maintains that from January of the year 2000, he fell out of the picture at the time that Mr. Daly ceased to be a guarantor. He has indicated that he knew nothing whatsoever of any connection between Mr. Phelan and Mr. O’Brien which would have had an impact on this transaction or any involvement of Mr. O’Brien in this transaction or in the financing of or the provision of finance or money for the earlier Mansfield transaction. .
Mr. O’Brien has indicated that he knows nothing of these two property transactions. The Tribunal will wish to inquire into the various overlapping relationships between Mr. Denis O’Brien, Mr. Aidan Phelan and Mr. Michael Lowry in connection with these two transactions; the manner in which they were funded; the fact that they do not appear to have been brought to the attention of the Tribunal, and that steps appear to have been taken as part of the transaction to conceal the identities of the true parties. The Tribunal will also wish to inquire whether there is any connection between these relationships such as they are, and the fact that Mr. Denis O’Brien and Mr. David Austin appear to have been involved in aspects of the Telenor payment of £50,000 sterling and the funding, whether by way of loan or otherwise, of a bank account which Mr. Michael Lowry had in the Irish Nationwide Isle of Man and which was not brought to the attention of the Tribunal. One further feature of all of these matters, is that the late Mr. David Austin is now dead. He died in 1998, in November of 1998. It would appear that he had a pivotal role in the first two transactions which I referred to, namely, the Telenor/ESAT transaction, and the payment into the account of Mr. Lowry’s in the Irish Nationwide (Isle of Man). If these matters had been brought to the attention of the Tribunal at an earlier date, the Tribunal would have had the benefit of discussing the matter with Mr. David Austin and ascertaining his views in relation to these matters. The Tribunal has been deprived of that opportunity. And it is a question that will have to be addressed to other parties involved in these transactions. That, Sir, completes the Opening Statement of today, and tomorrow it is intended that we would continue with the Registrar to the Tribunal reading the deposition of Mr. Haughey into the record of the Tribunal. CHAIRMAN: It’s probably right to say in conclusion, Mr. Coughlan, that the lengthy matters that you have opened today, particularly in the afternoon, relate to an outline of evidence that it is intended to lead rather than setting forth any final or even provisional conclusions in any way. CHAIRMAN: I think it is also the case, Mr. Coughlan, that this does all occur at a delicate time in the context of other issues that are pending in the commercial world and the Tribunal has had regard to that factor, but that having regard to the time factors that have elapsed, the amount of material that is already in the public domain, we have felt it incumbent on us to proceed with this evidence. In forming that view, I am doing so in the belief that the high standards of coverage and objective reportage will be observed in dealing with the matter as the days ensue. MR. COUGHLAN: Perhaps I should emphasise once again, Sir, all I am doing today is giving an outline statement in relation to matters which the Tribunal intends to inquire into in public. It would be wrong for anyone, at this stage, to draw any conclusions in relation to any of these matters until the evidence has been led in public, has been tested in public and ultimately the matter is reported on by you, Sir. CHAIRMAN: I think I will make it eleven o’clock tomorrow in ease of Mr. Lehane’s larynyx. THE TRIBUNAL THEN ADJOURNED UNTIL THE FOLLOWING DAY, WEDNESDAY, 23RD MAY 2001, AT 11AM.